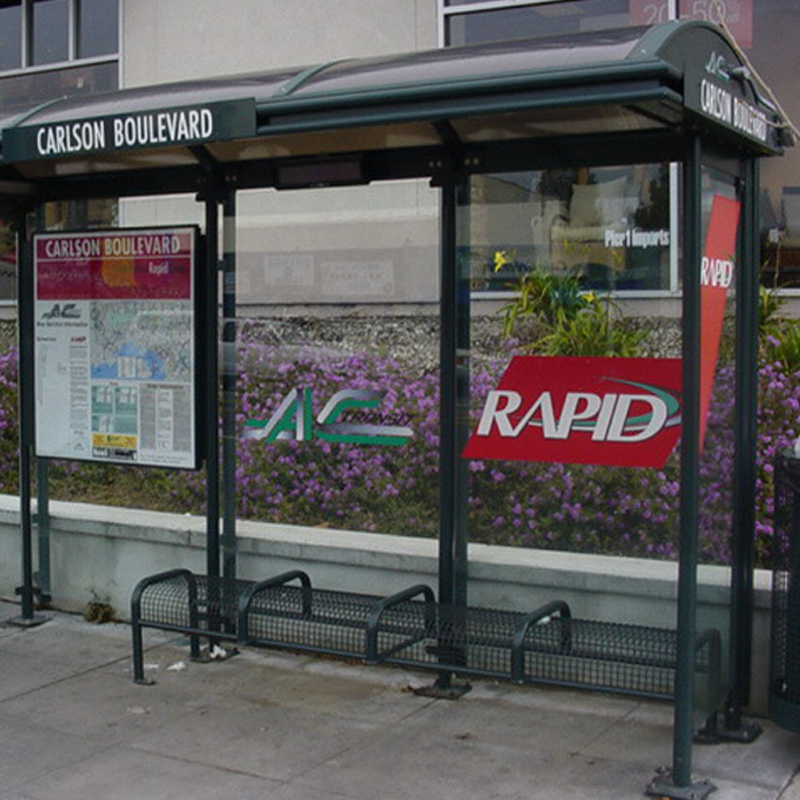 The perfect fit for transit corridors and pedestrian-heavy downtowns. 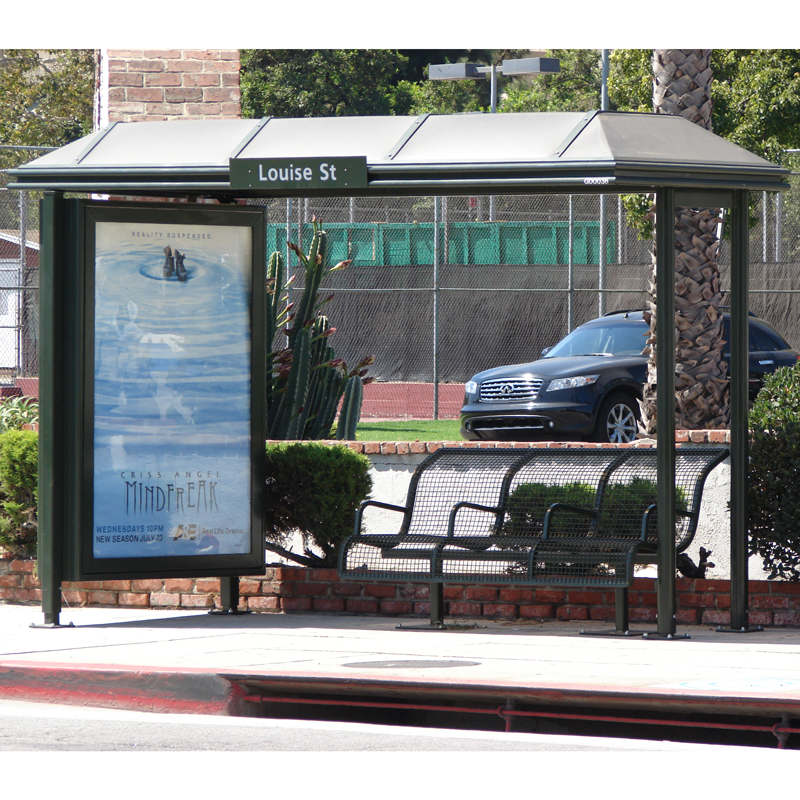 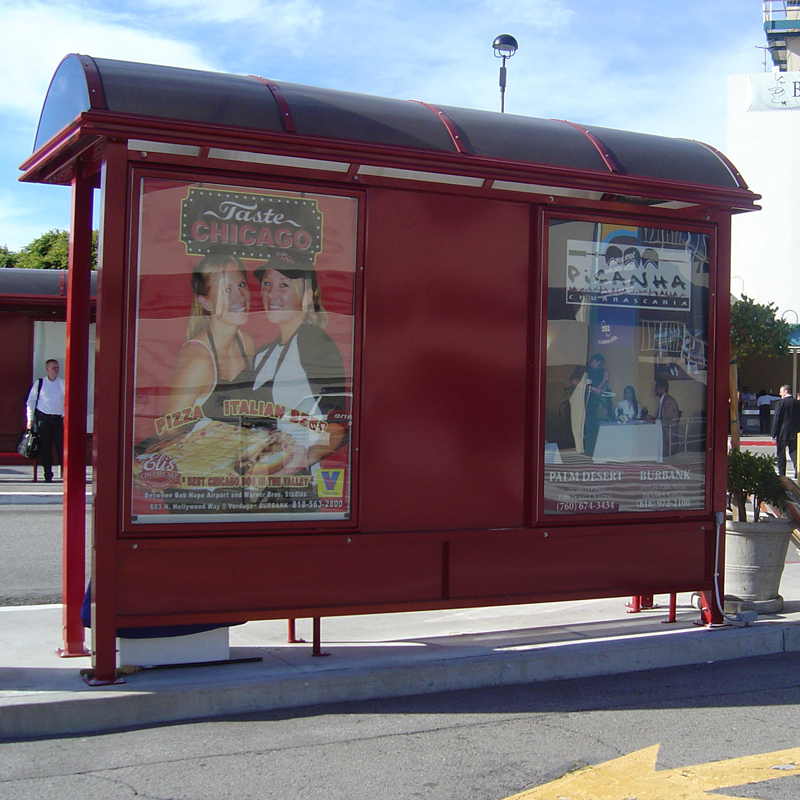 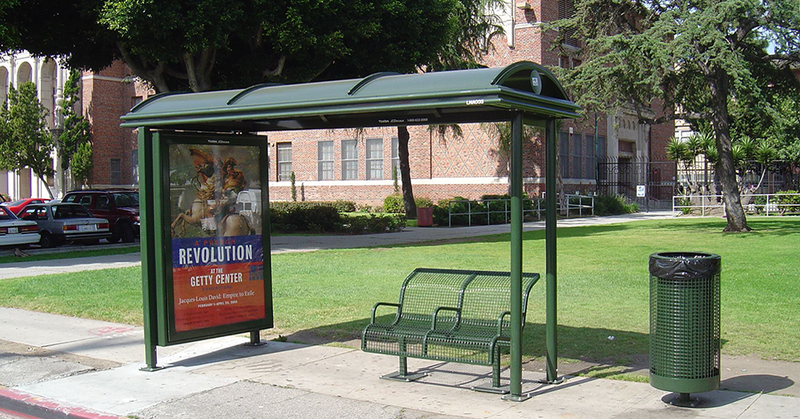 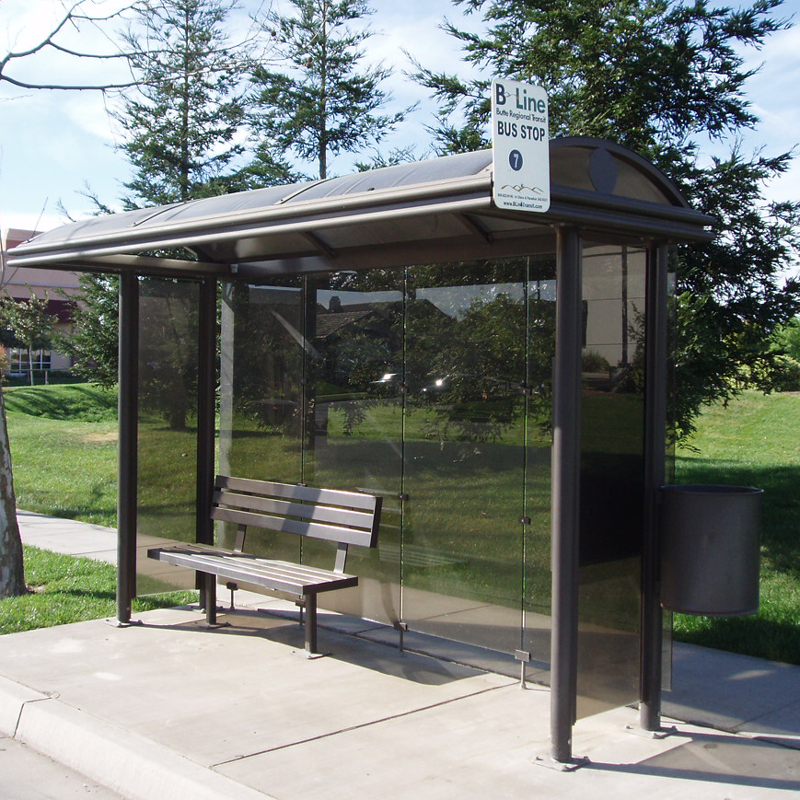 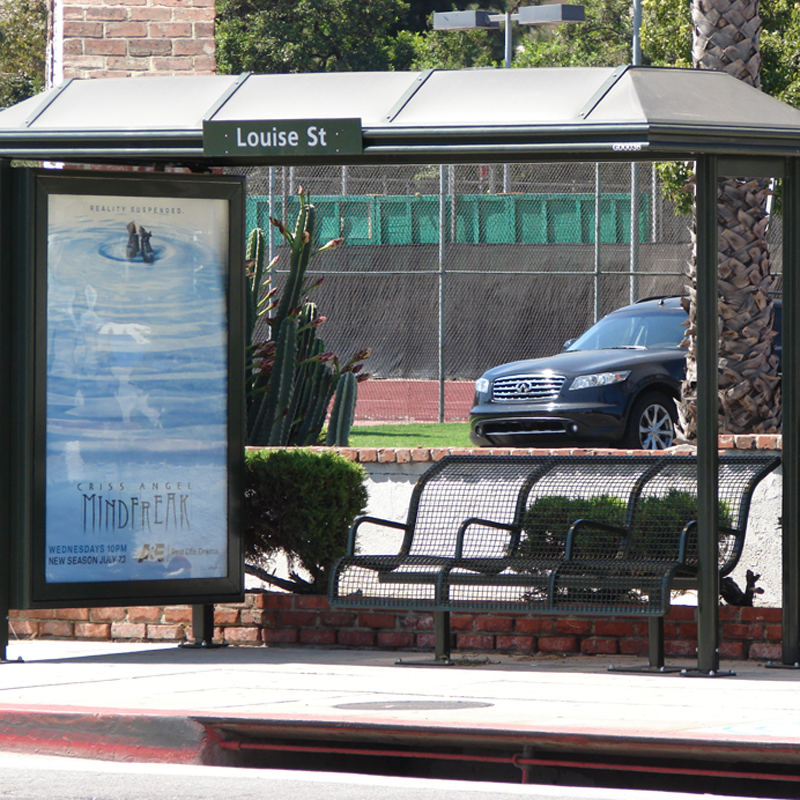 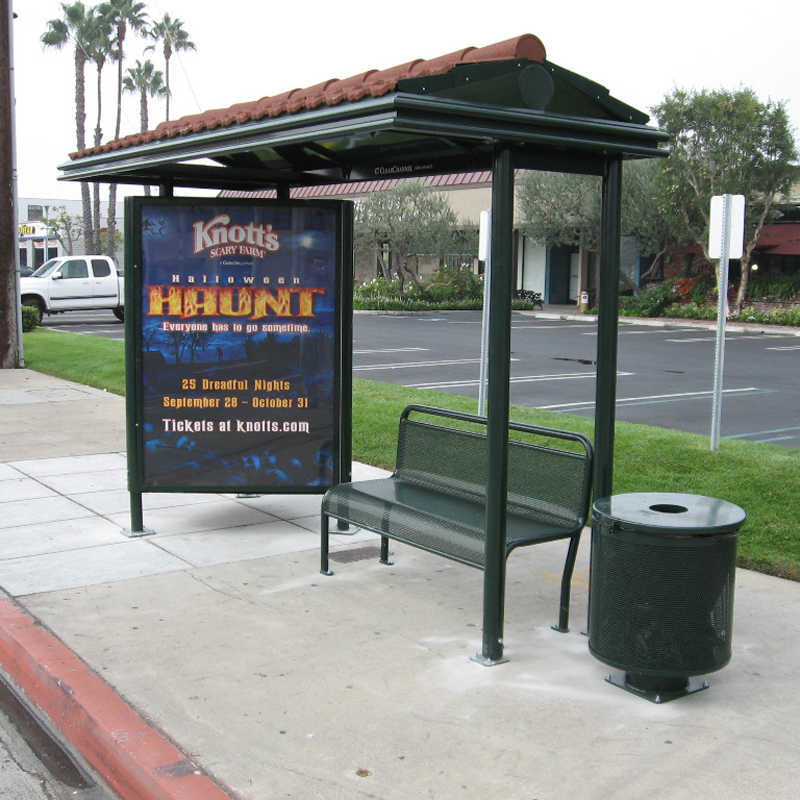 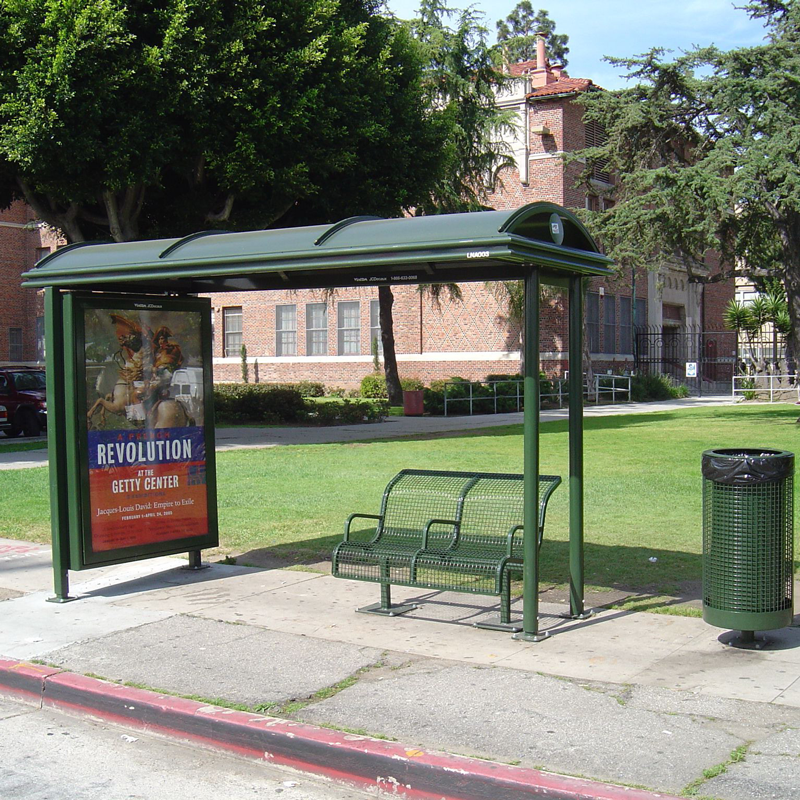 Our flagship Sierra Transit Shelter Series remains one of Tolar Manufacturing’s most popular bus stop shelter designs. 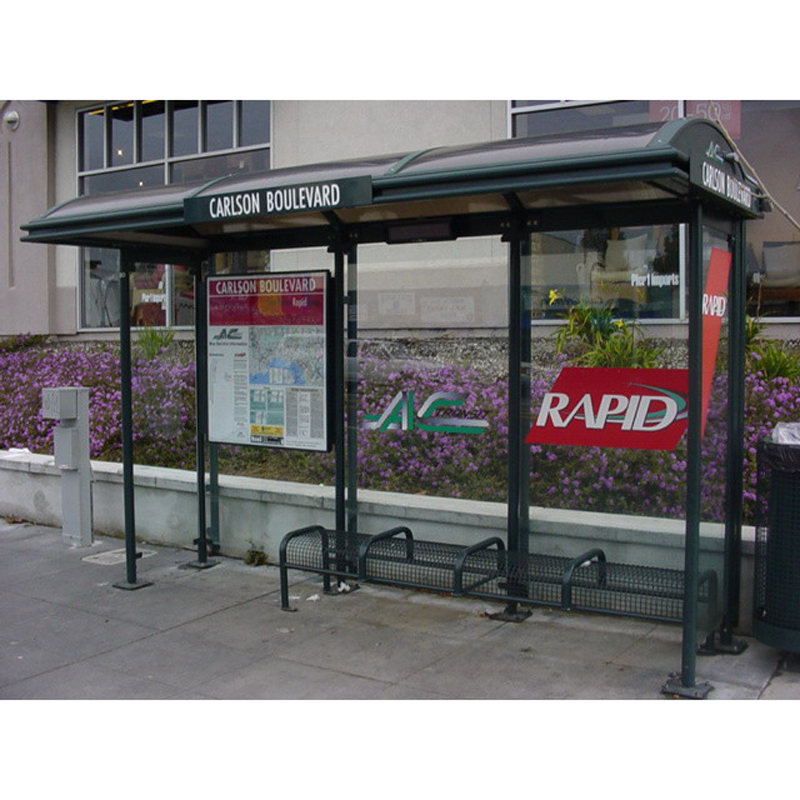 Originally engineered for a public transit project in San Diego over 25 years ago, this series continues to be a client favorite with its classic look and purpose-driven design. 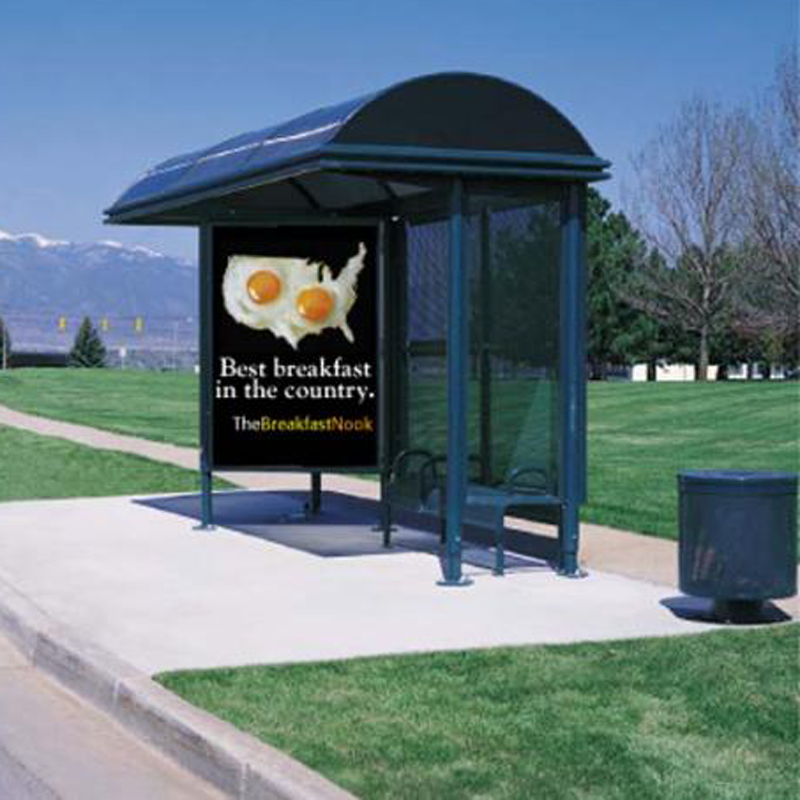 As the years have progressed so too have client expectations. 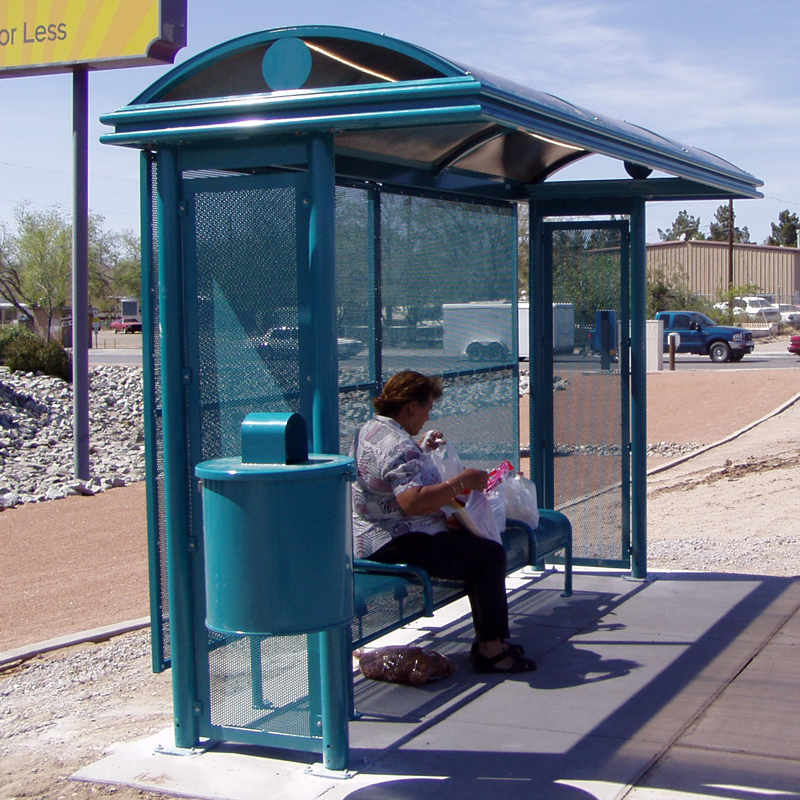 As such, our forward-thinking designers and experienced engineers have developed even more design elements for this transit shelter line to balance the classic style with the need for modern amenities. 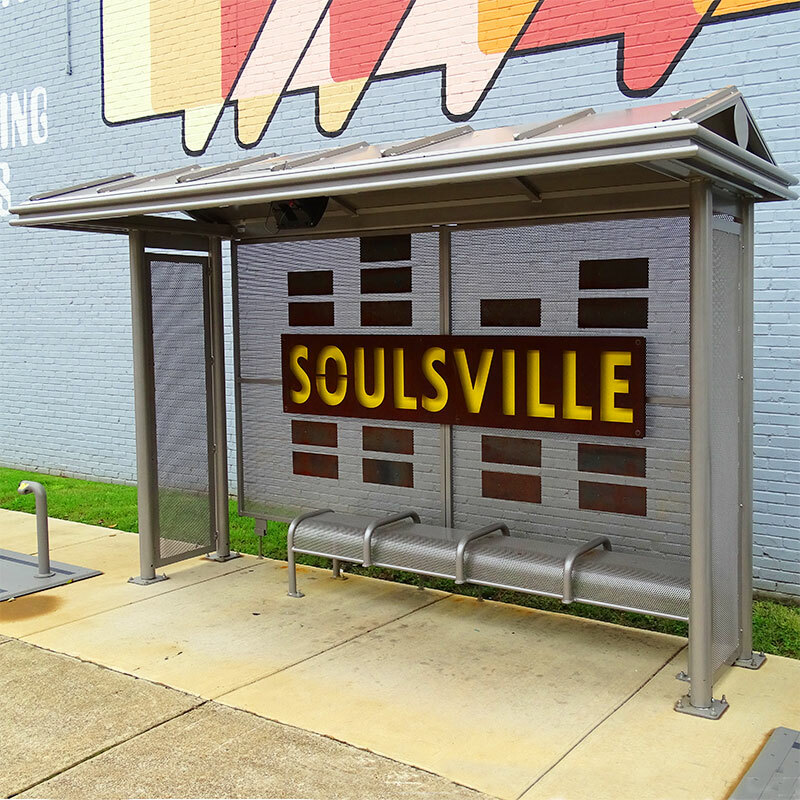 13-foot non-advertising shelter integrating public art into a durable Sierra series shelter that includes an eight-foot perforated metal bench, shade-producing low peak roof, and bright yellow, neighborhood-identifying, “SOULSVILLE” branding emblazed across the rear wall. 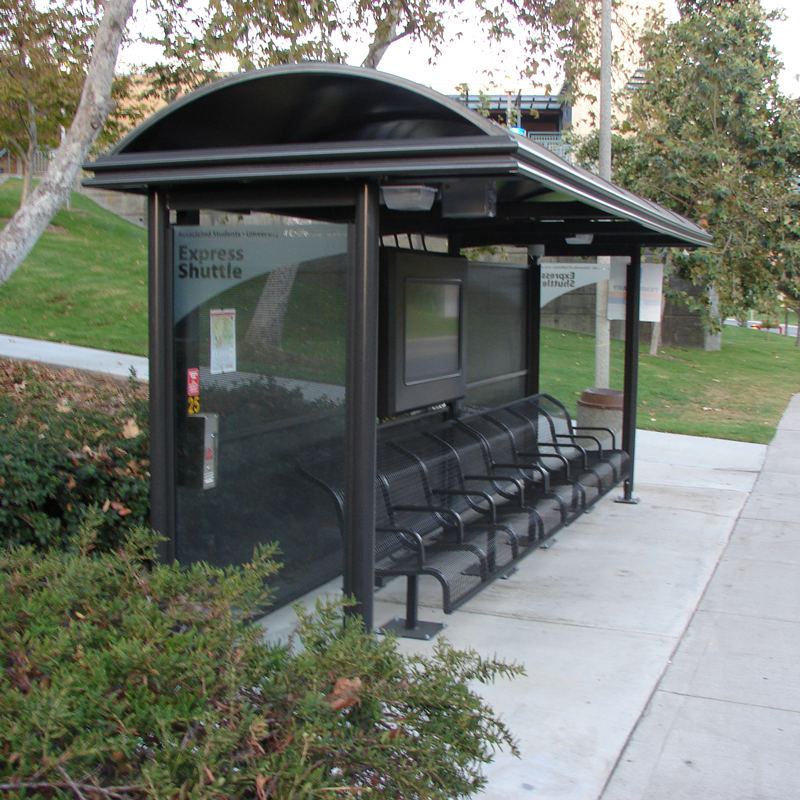 The addition of the rectangles on the rear wall are reminiscent of equalizer sound bars so important in the music industry. 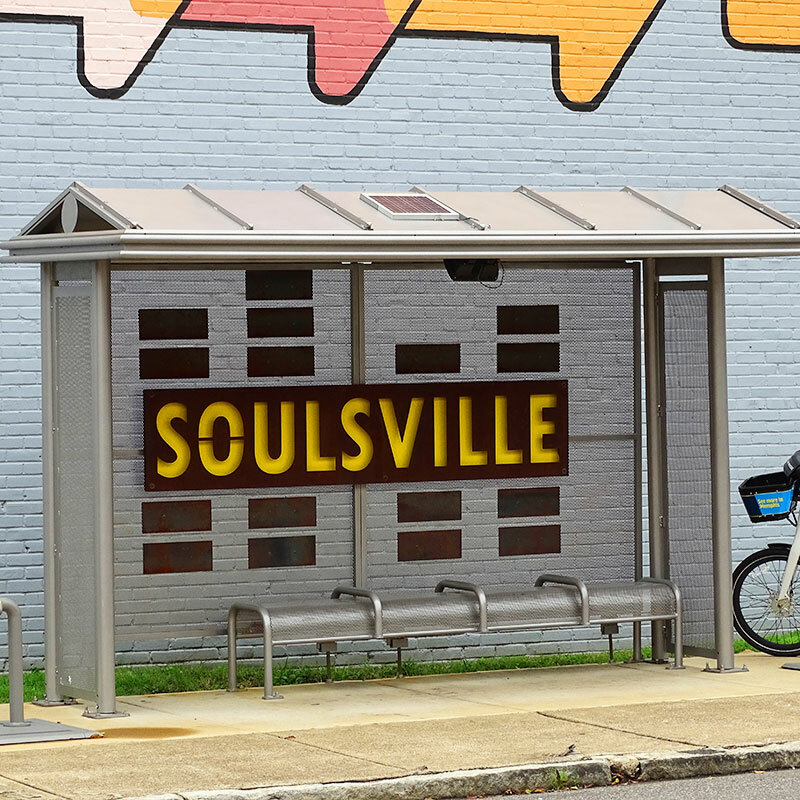 Continuing with the Sense of Place™ created by the transit shelter, the community also added a bike share option to help travelers with first mile, last mile mobility. 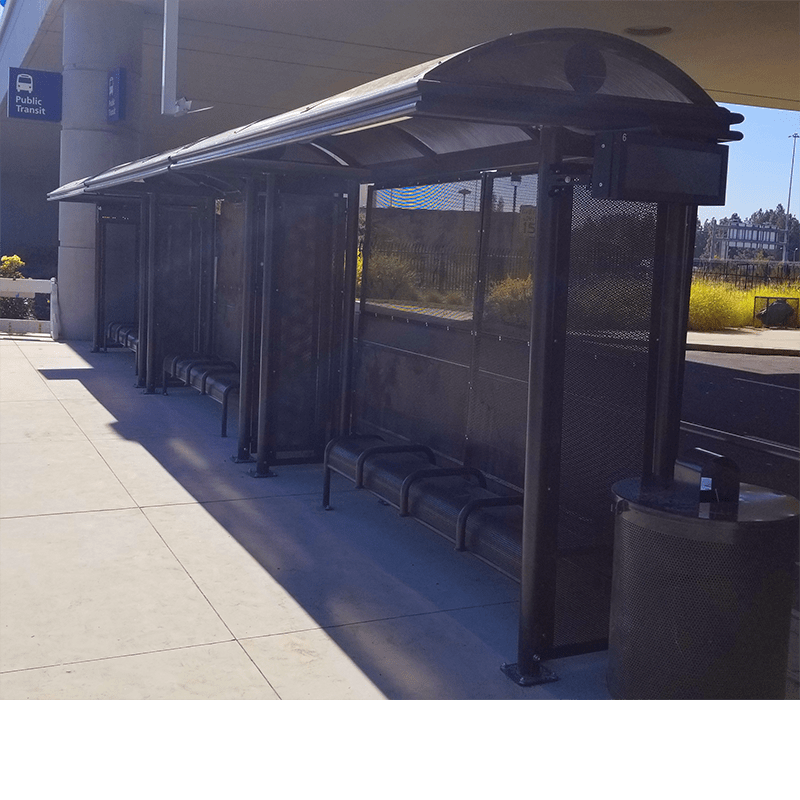 These 13-ft Tolar-built, non-advertising Sierra line transit shelters fabricated for Yolo County Transportation District (YCTD) are located at Sacramento International airport, helping travelers with multi-modal transportation and first mile-last mile needs. 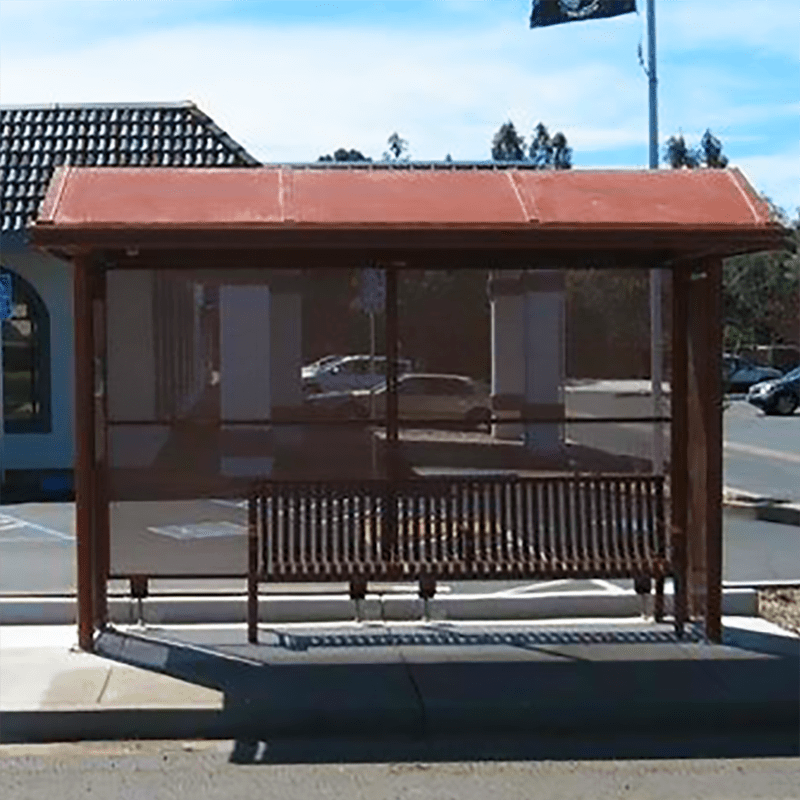 This High Peak Sierra non-advertising shelter is located in front of a VA Outpatient Clinic in Clearlake, California and is a reminder of the vital role public transit plays in moving our U.S. veterans through out their communities. 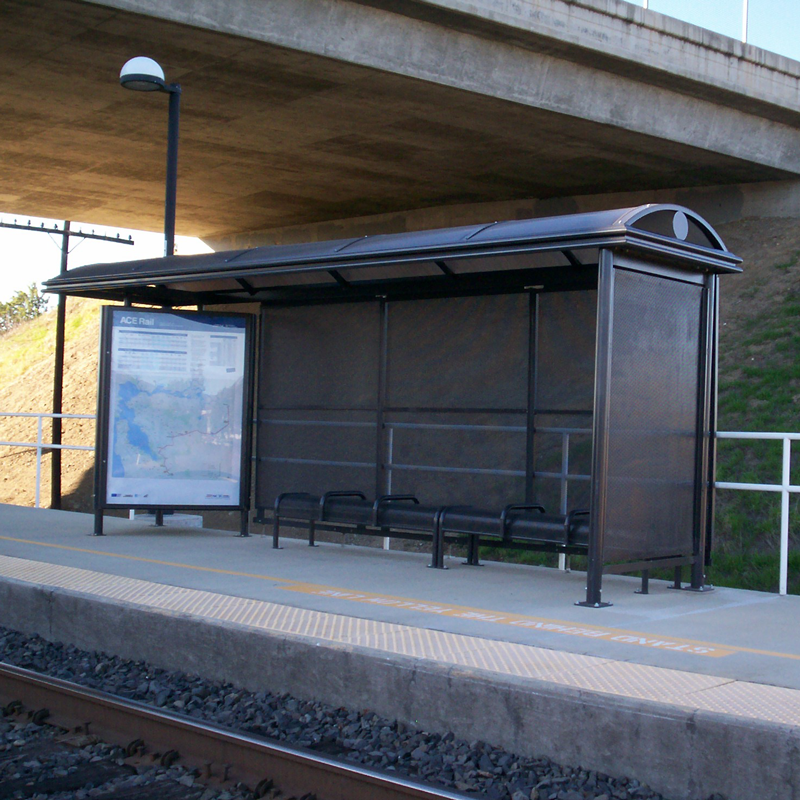 9’ Sierra dome roof non-advertising shelter with aluminum roof panels, decorative battens, dusk to dawn LED solar illumination, Victorian-style perforated metal rear wall and high visibility paint scheme to match agency branding. 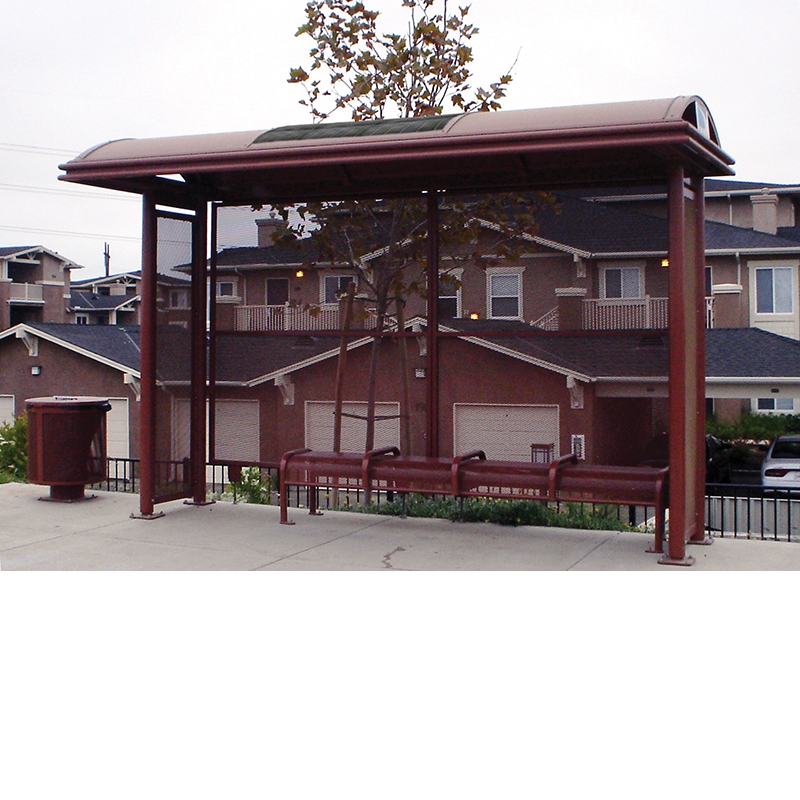 13′ Sierra high peak roof transit shelter with 1/8” aluminum roof panels roof tile, perforated metal rear and end walls, perforated metal bench with no back and three anti-vagrant bars. 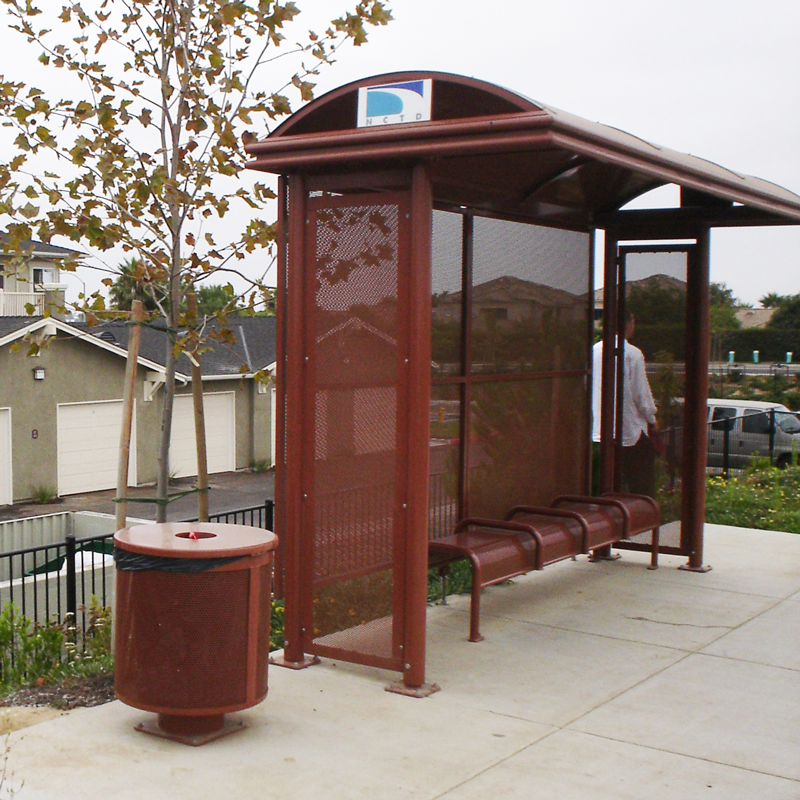 Also, pole mount trash receptacle with hinged and covered lid. 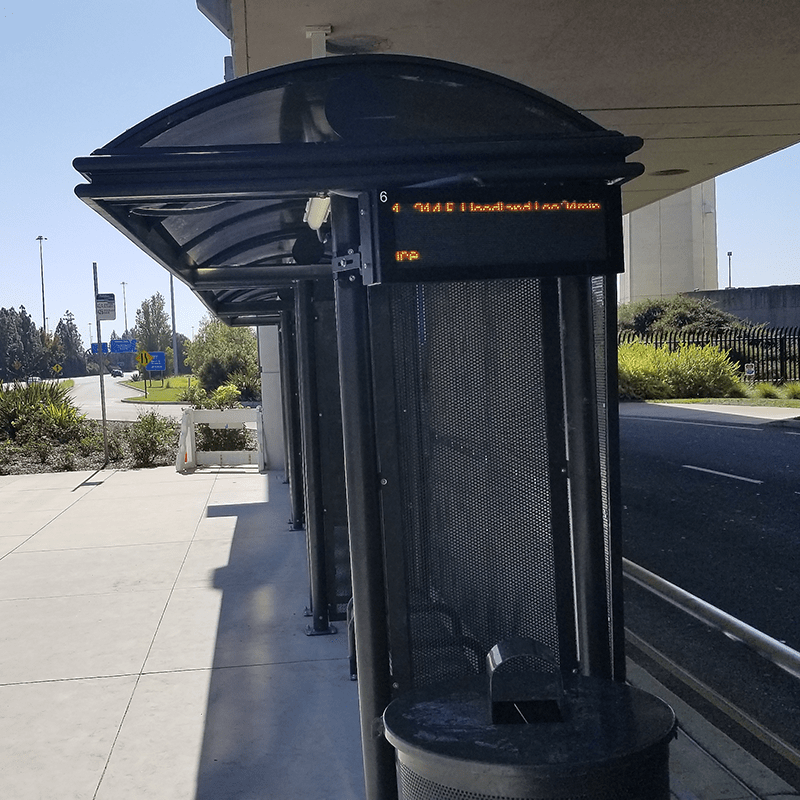 Solar illumination. 18’ Sierra dome roof shelter with bronze twin wall polycarbonate roof panels, perforated aluminum in the bottom of the walls, and 3/8” clear glass in the top section. 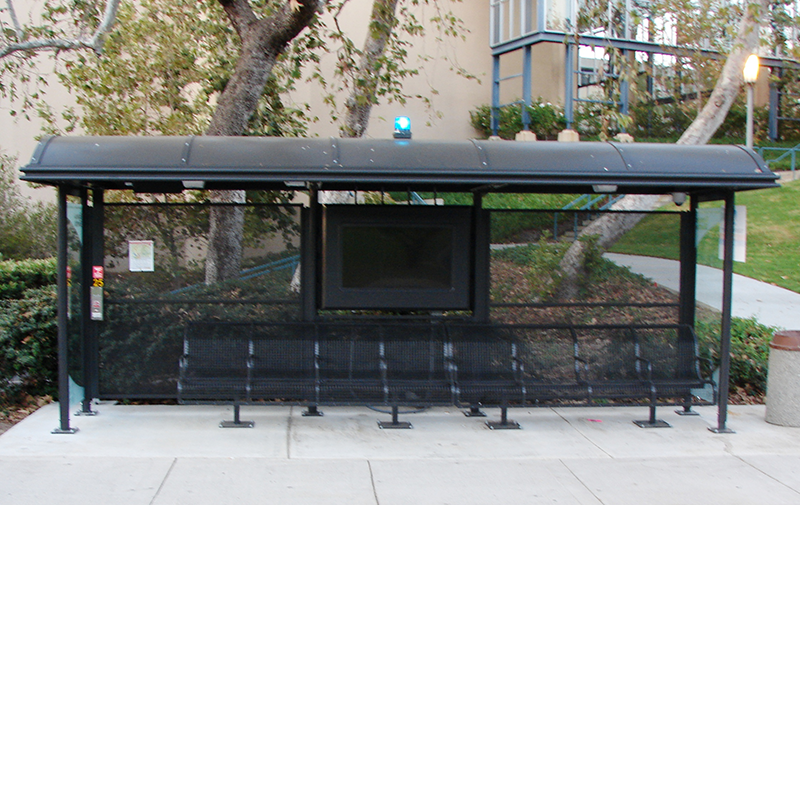 Also, integrated passenger information case, seating and covered integrated bike loops. 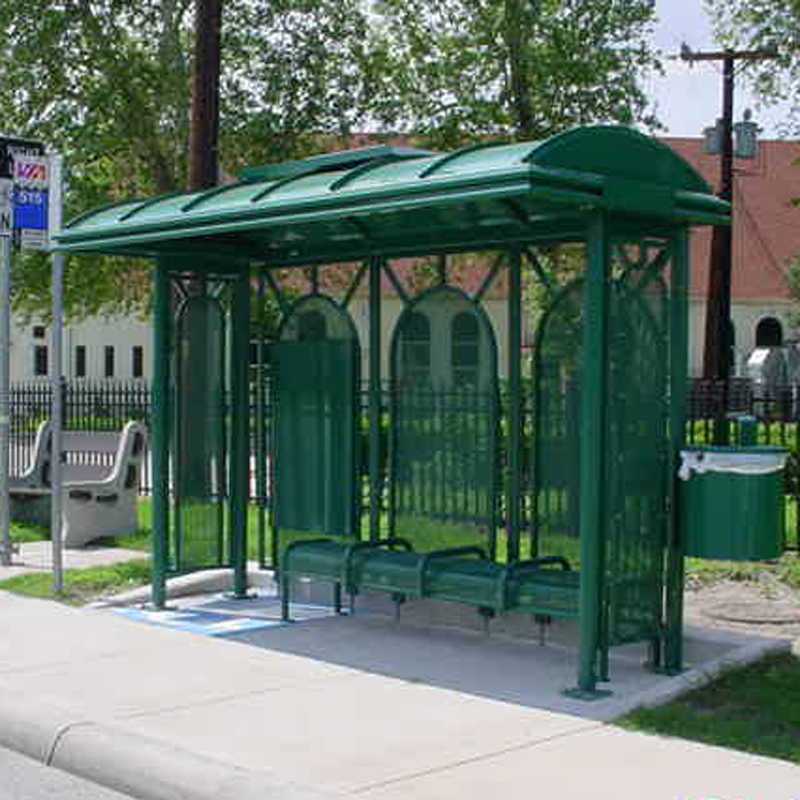 13′ Sierra dome roof transit shelter with aluminum roof panels, agency logo, perforated metal rear and end walls. 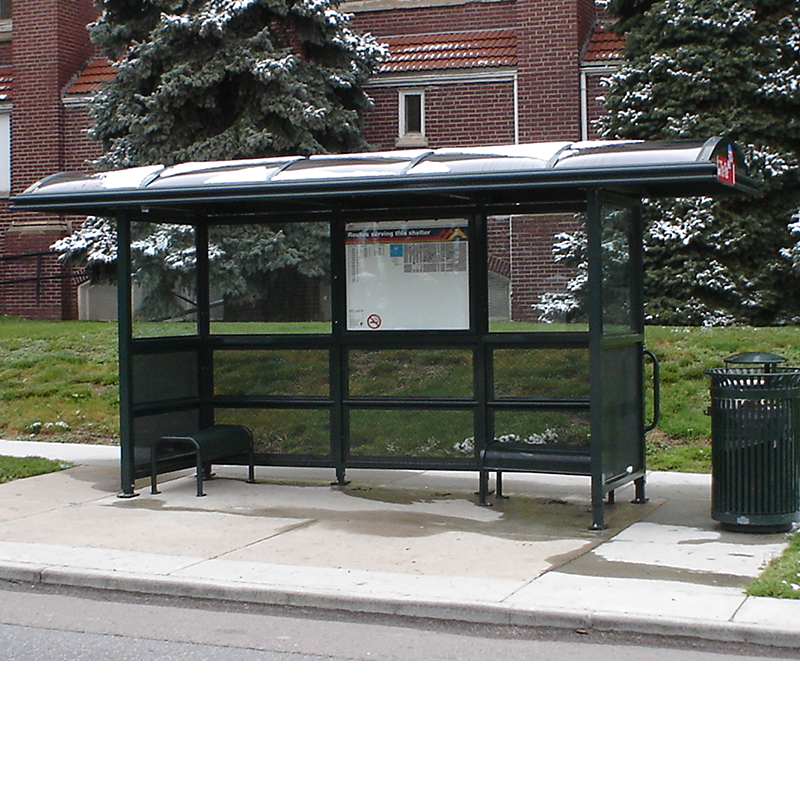 Also, perforated metal bench with no back and three anti-vagrant bars, and perforated metal trash receptacle. 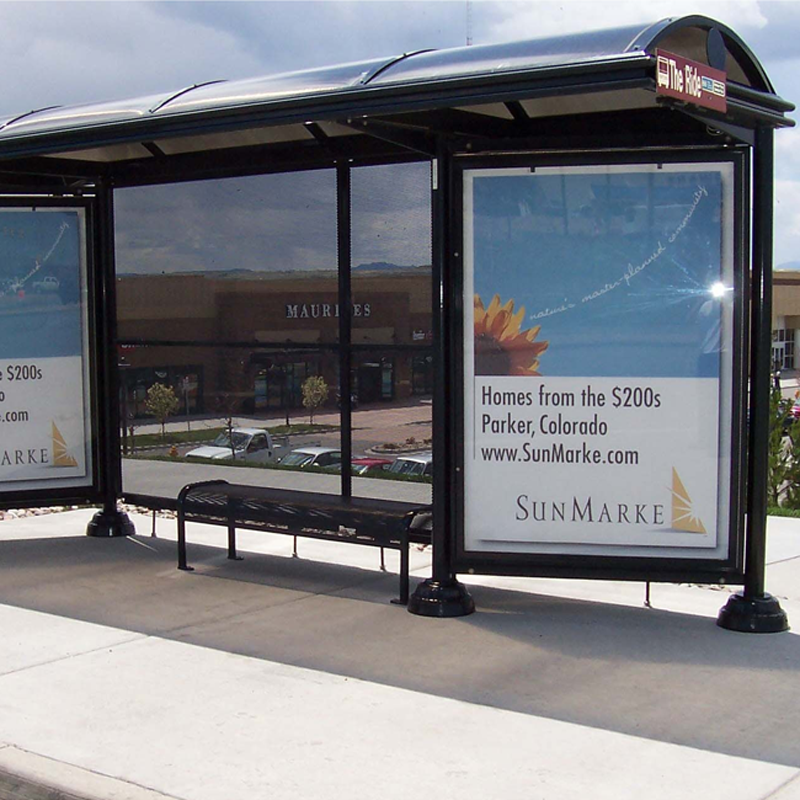 Solar illumination. 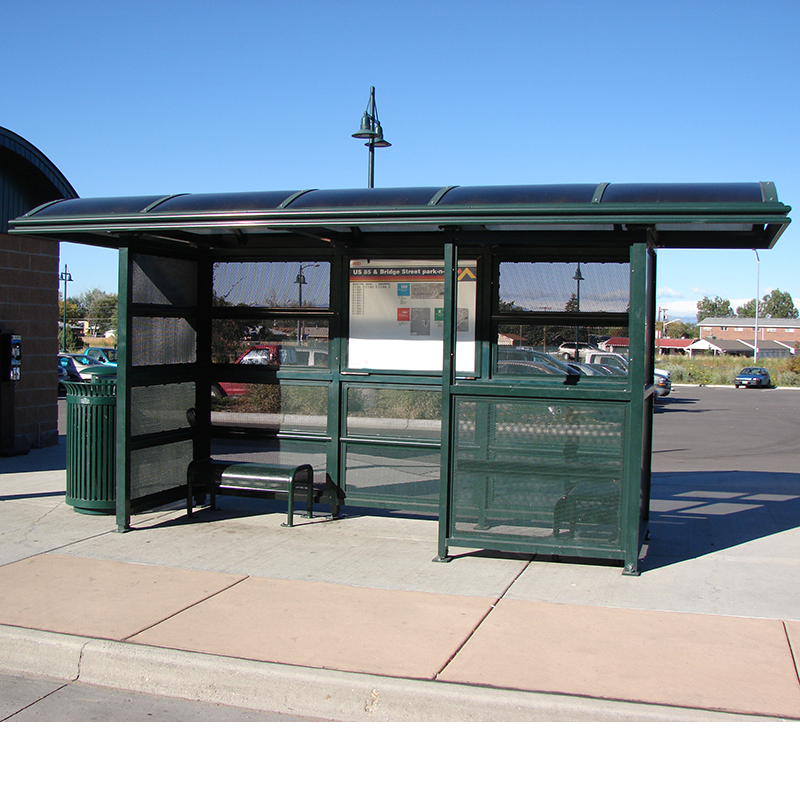 9′ Sierra dome roof transit shelter with aluminum roof panels, decorative perforated metal wall panels, integrated two side map case, solar illumination and a 4′ steel strap bench with back. 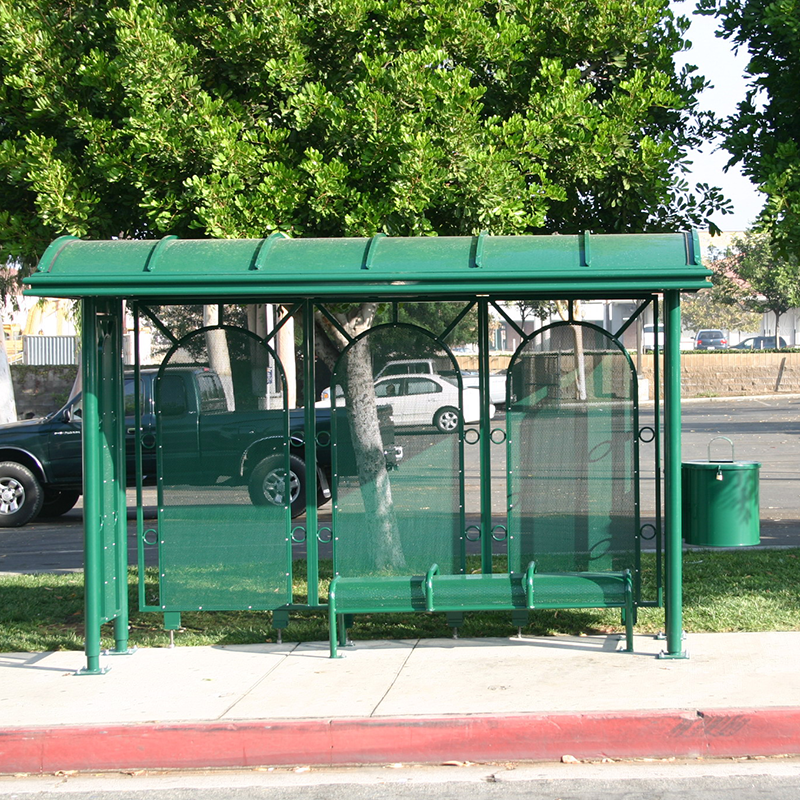 13′ Sierra dome roof transit shelter with bronze Lexan roof panels, roof ends closed off with aluminum, twin decorative rear posts, 3/8″ clear tempered safety glass walls, integrated rear wall map case, wire grid bench with anti-vagrant bars, agency branding. 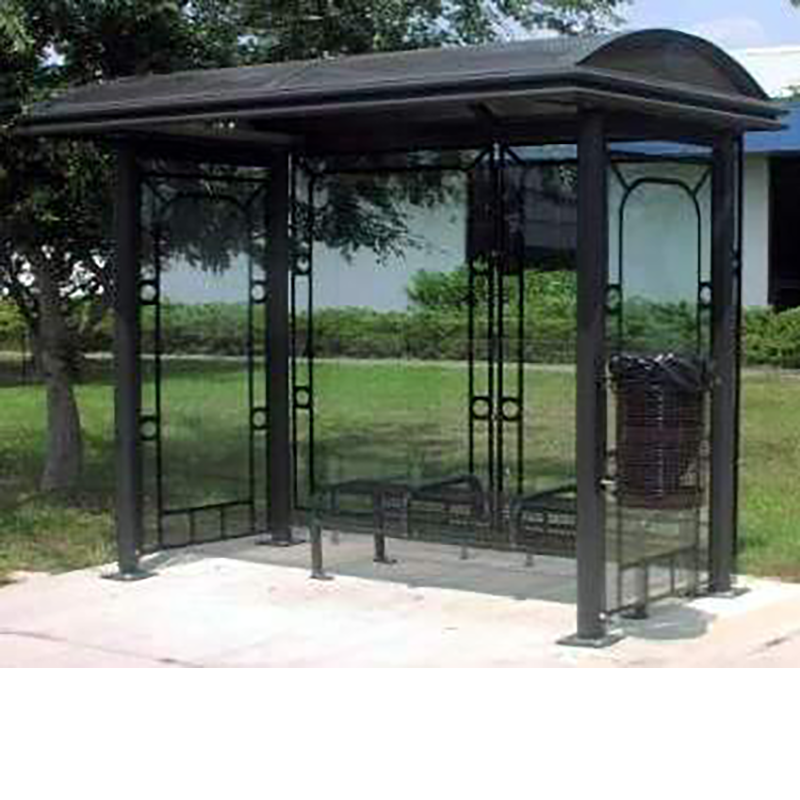 13′ Sierra dome roof transit shelter with aluminum roof panels, decorative roof battens, Victorian style perforated metal rear and end walls, perforated metal benches and pole mount trash receptacle with hinged and covered lid. 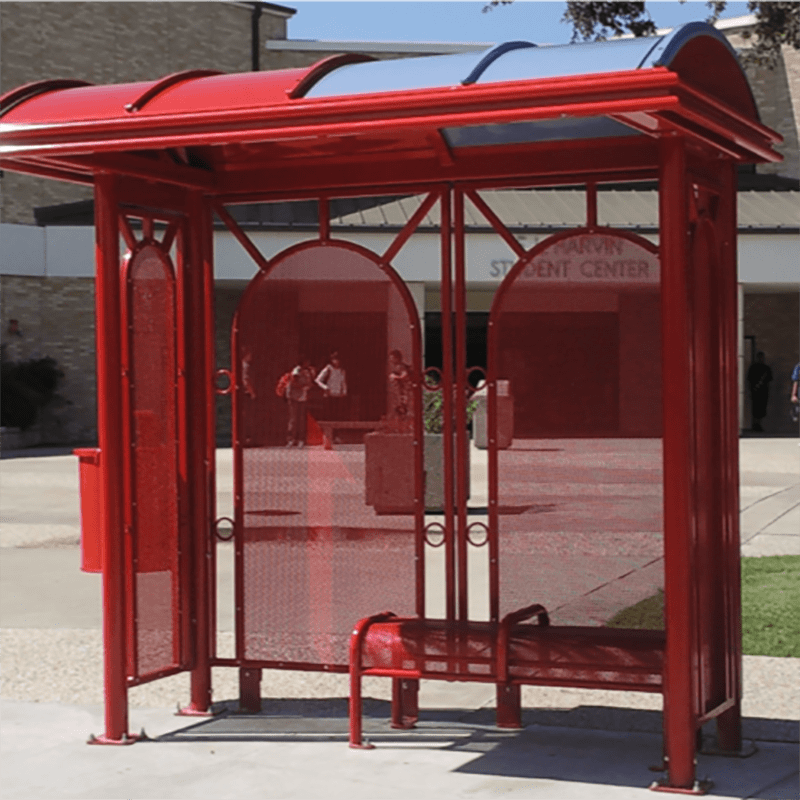 13′ Sierra high peak roof transit shelter with aluminum roof panels, decorative battens, street branding, decorative wire grid perimeter, glass walls, and steel strap bench with back and anti-vagrant bars. 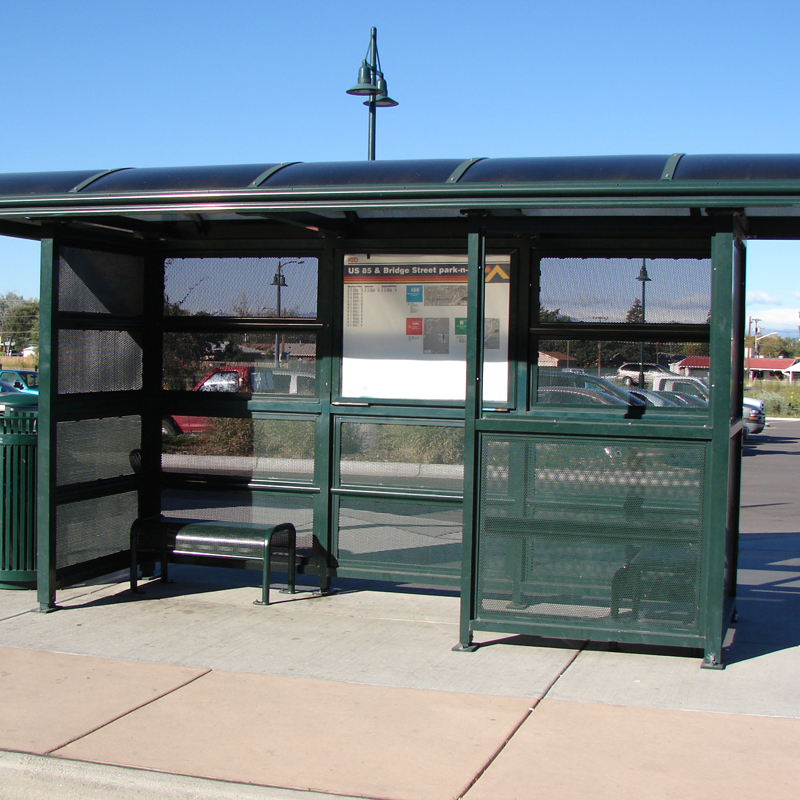 13′ Sierra high peak transit shelter with aluminum roof panels, wire grid fascia at the roof line and a perforated metal bench with anti-vagrant bars. 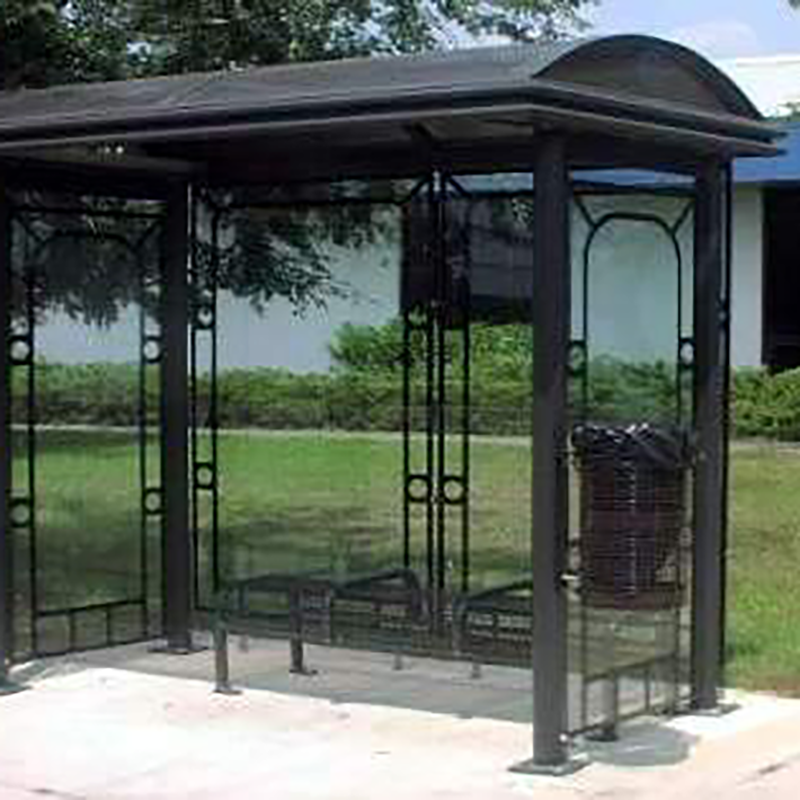 13′ Sierra dome roof transit shelter with bronze Lexan roof panels, 3/8″ Victorian style fritted glass panels at the rear and end walls, wire grid bench and trash receptacle. 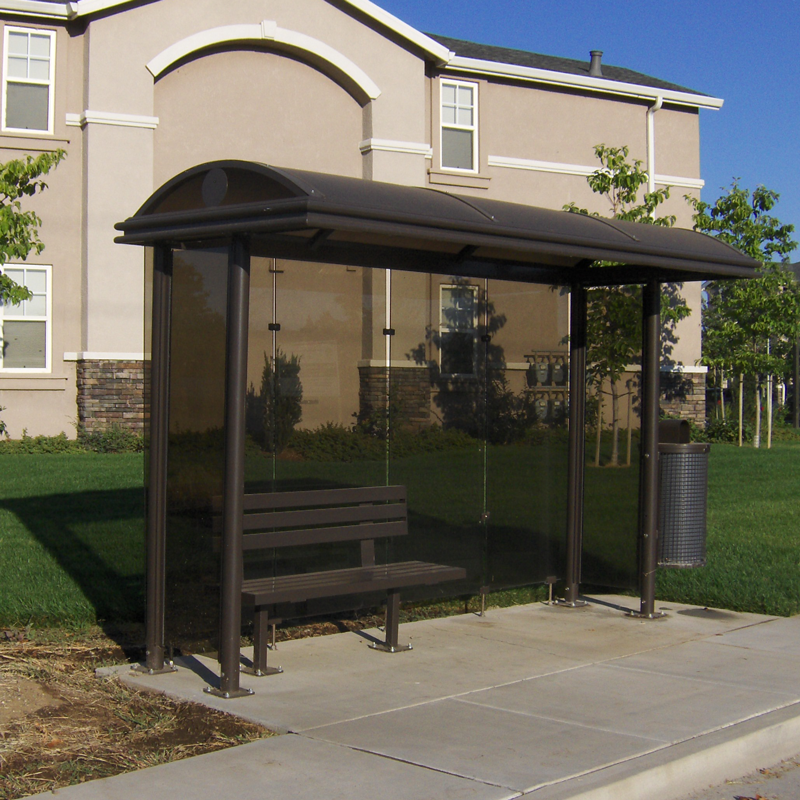 13′ Sierra dome roof transit shelter with Lexan roof panels and bronze tempered safety glass. 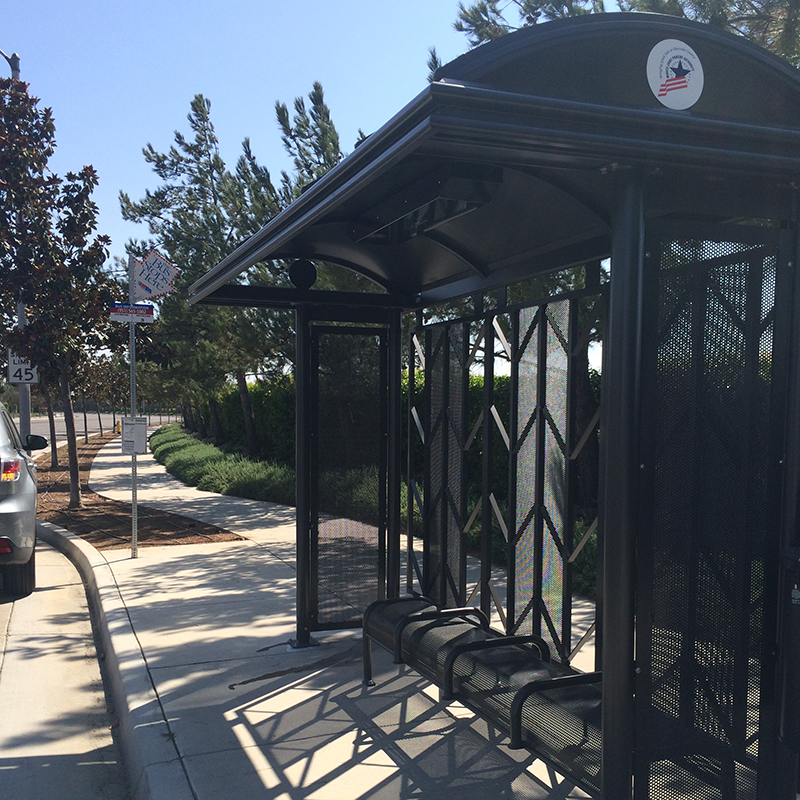 17′ Sierra dome roof transit shelter with aluminum roof panels, decorative battens, custom herringbone pattern rear wall, escutcheons, integrated end wall map case, and steel strap bench with back. 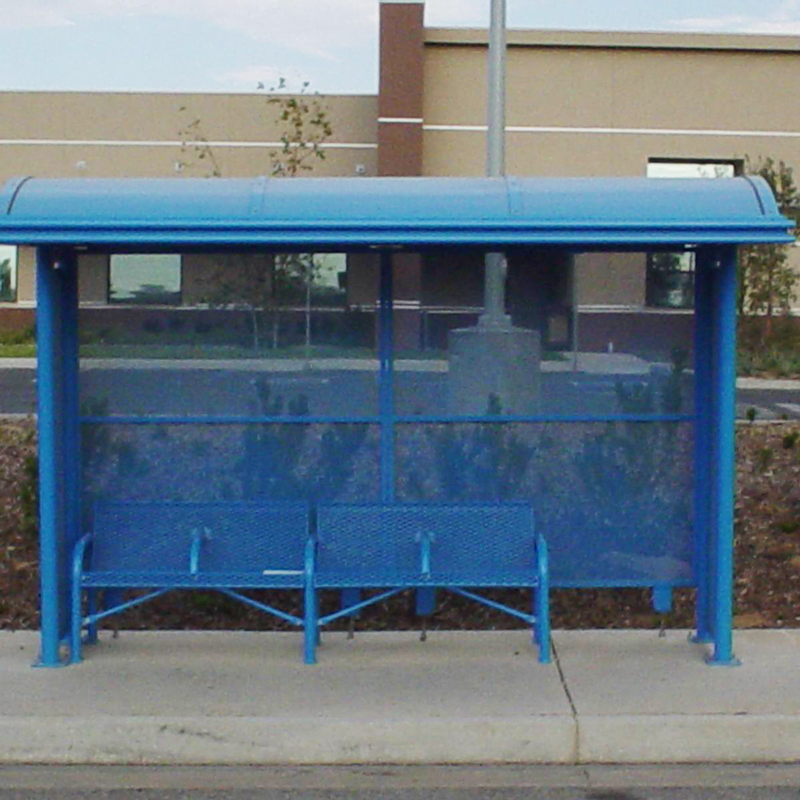 13′ Sierra dome roof transit shelter with aluminum roof panels, perforated metal rear and end walls, and expanded metal bench with back and anti-vagrant bars. 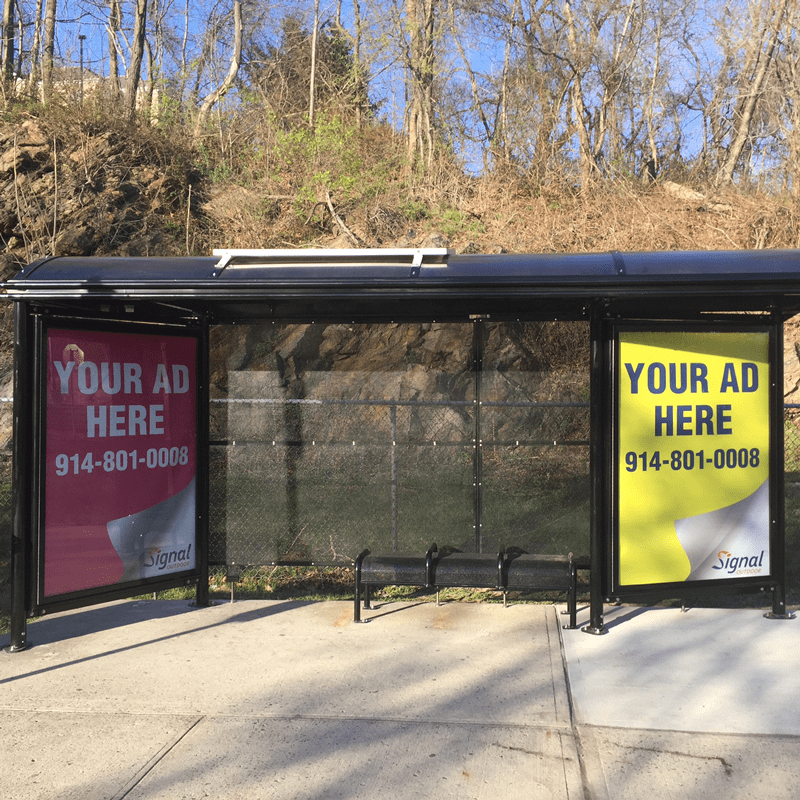 13′ Sierra advertising shelter with low peak, solar-powered illuminated roof, perforated metal walls, media display kiosk, and backless bench with anti-vagrant bars. 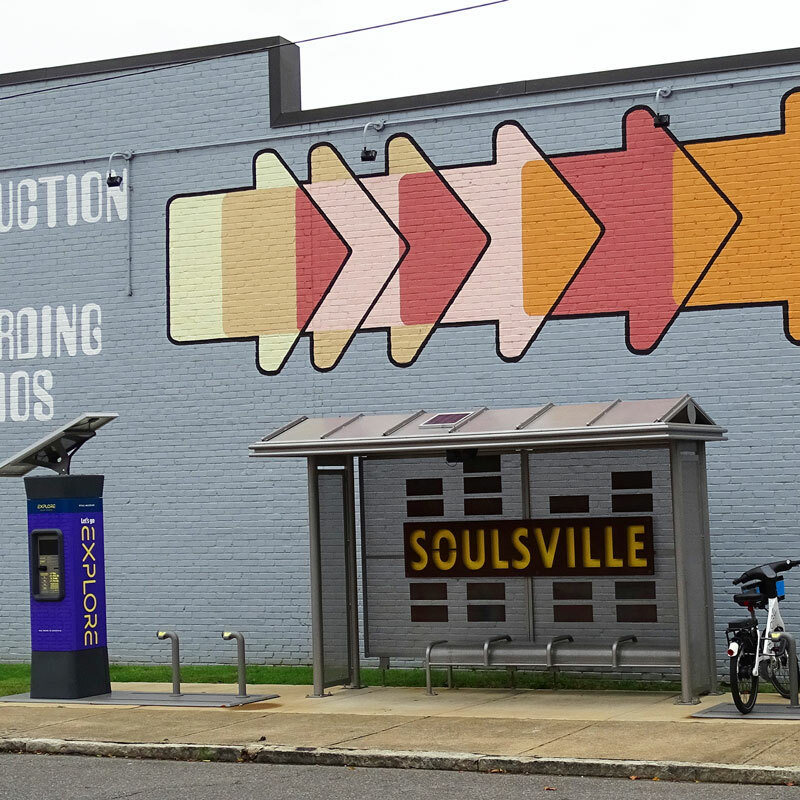 Located in New Orleans. 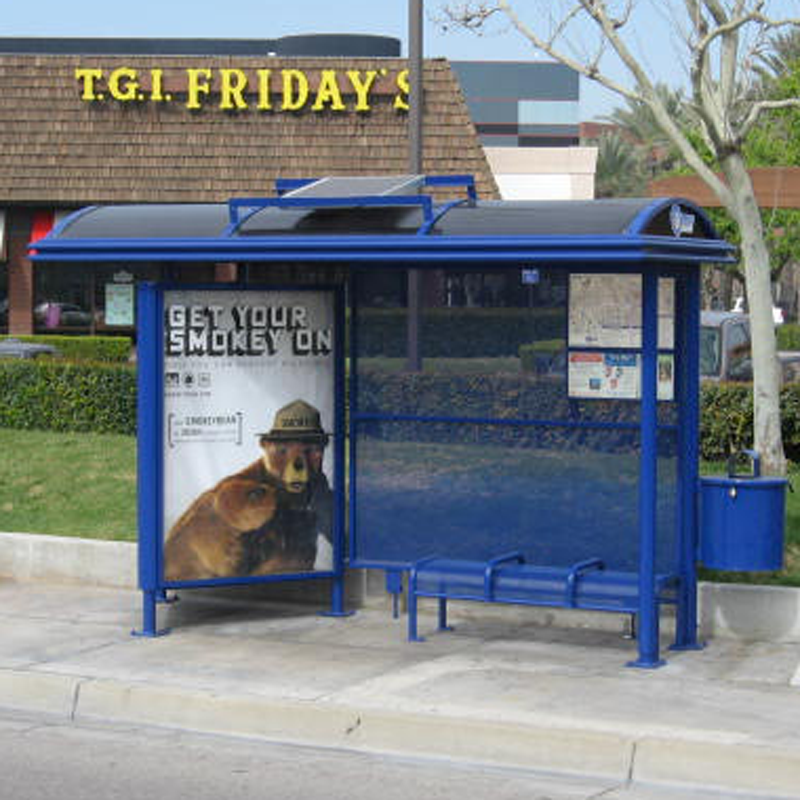 17′ Sierra dome roof advertising transit shelter with bronze twin wall polycarbonate roof panels, two angled advertising display kiosks, perforated aluminum rear walls, solar illumination, and a perforated metal bench. 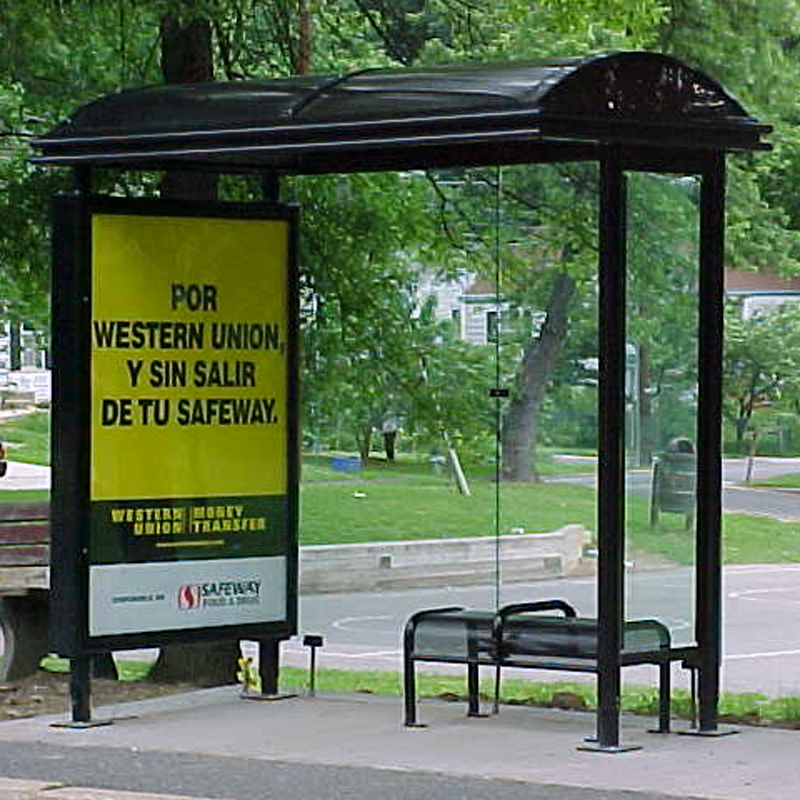 Located in Westchester County, NY. 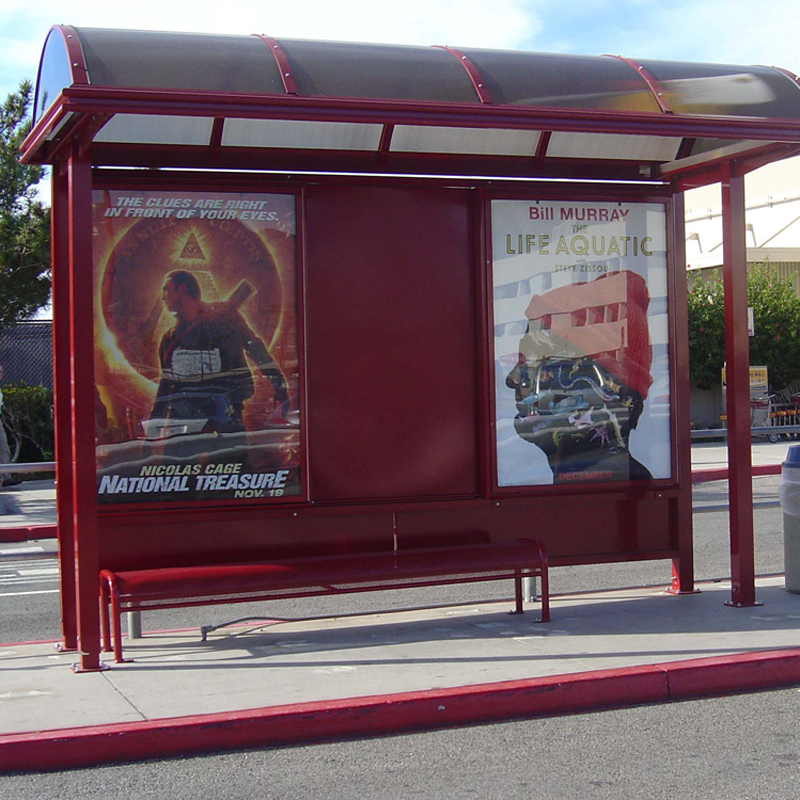 17’ Sierra dome roof advertising transit shelter with aluminum roof panels, V angled advertising display kiosk, 4 seat perforated metal bench and LED solar powered illumination in the advertising kiosk and roof. 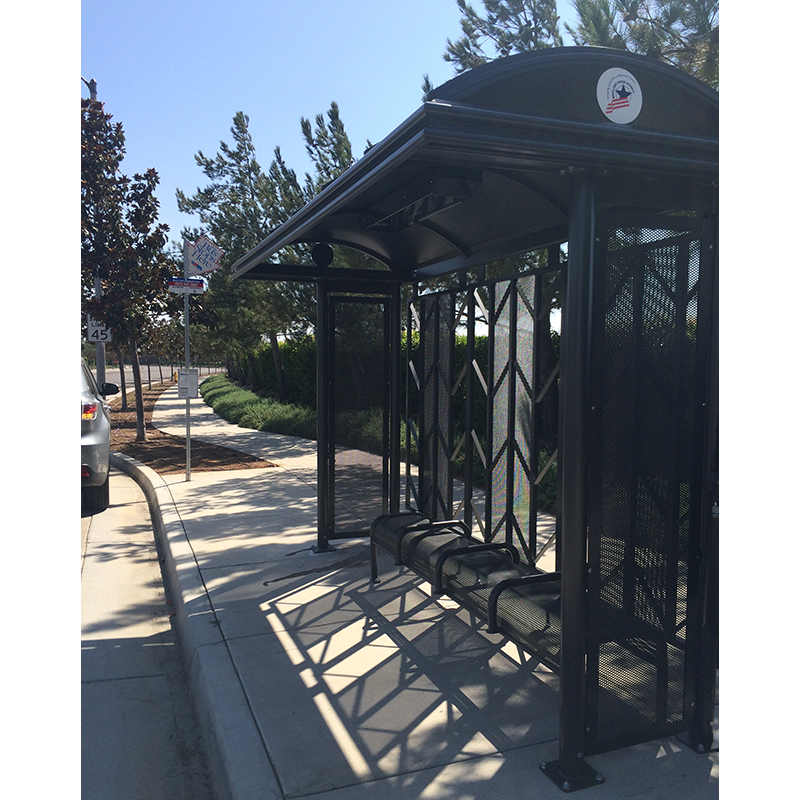 13′ Sierra dome roof transit shelter with aluminum roof panels, backlit semi-v advertising kiosk, and 4′ wire grid contour bench with back. 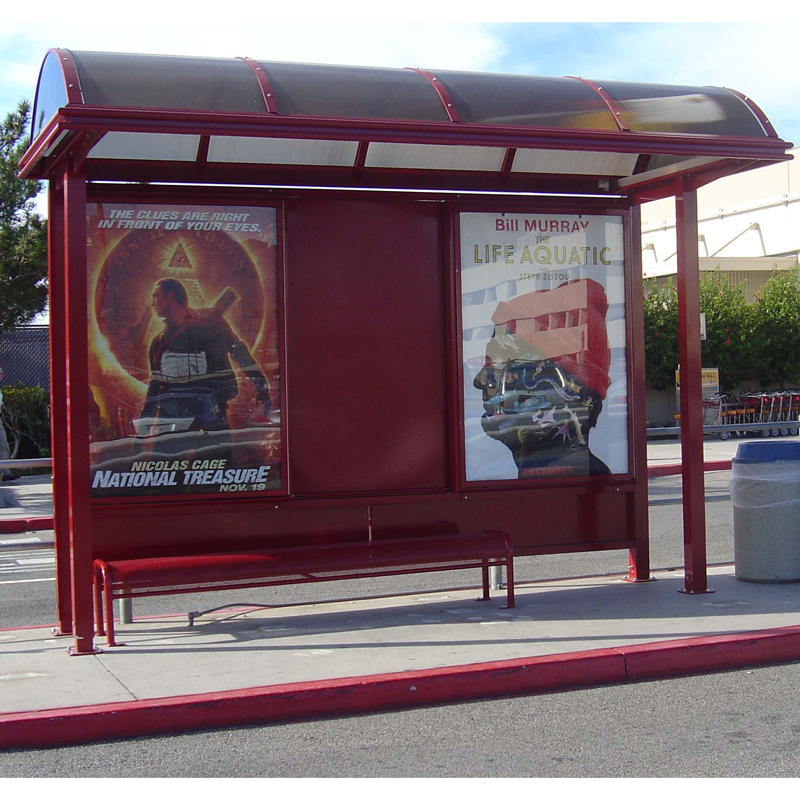 13′ Sierra low peak roof transit shelter with Gerard roof tile , v angled backlit advertising kiosk, no walls, 6′ perforated metal bench with back, and perforated metal trash receptacle. 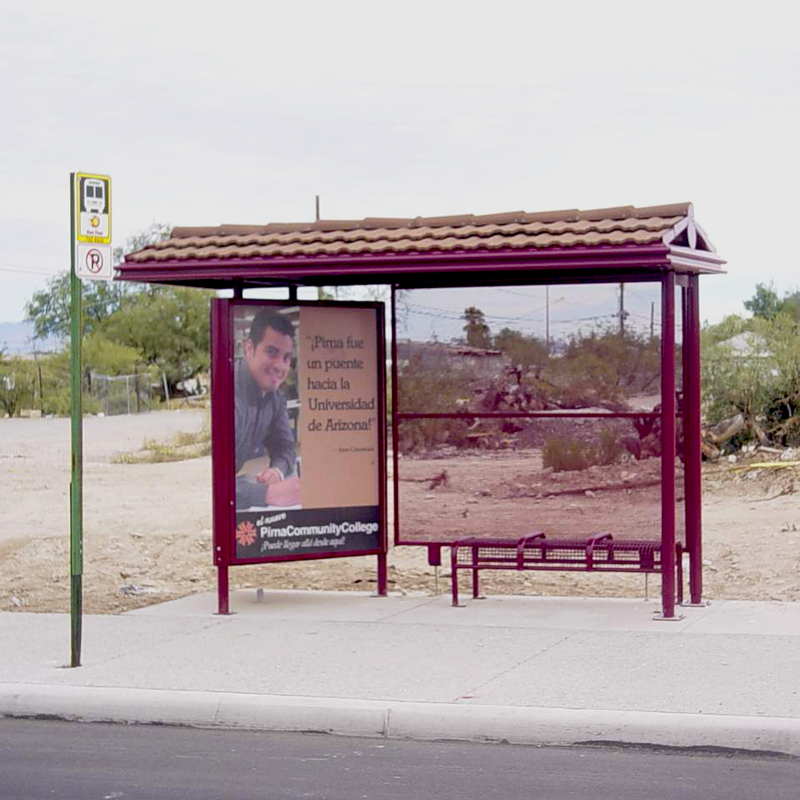 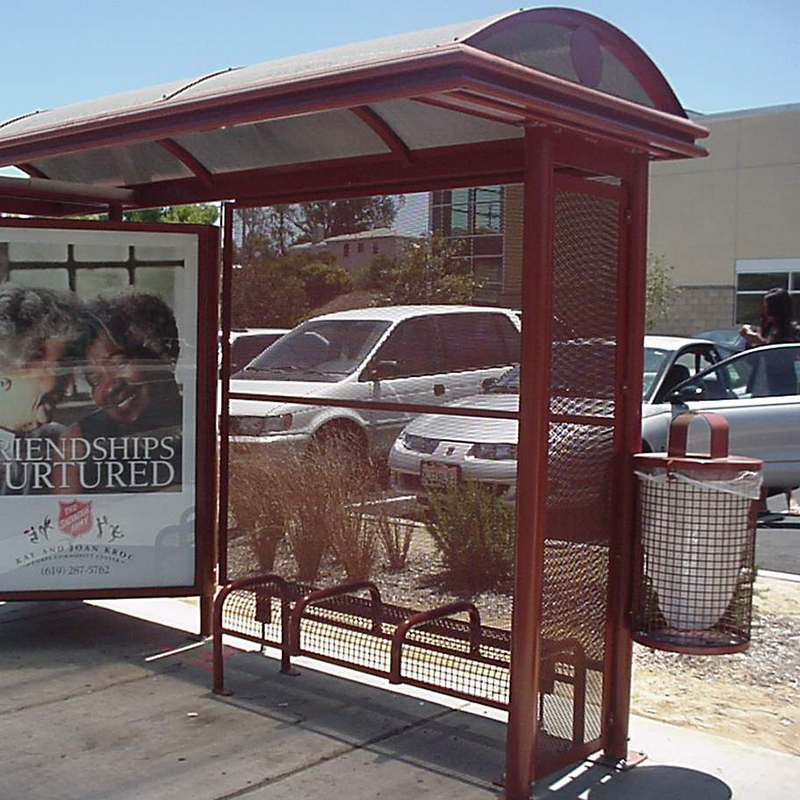 13′ Sierra low peak roof transit shelter with Gerard roof tile , v angled backlit advertising kiosk, perforated metal rear wall, and 5′ wire grid bench. 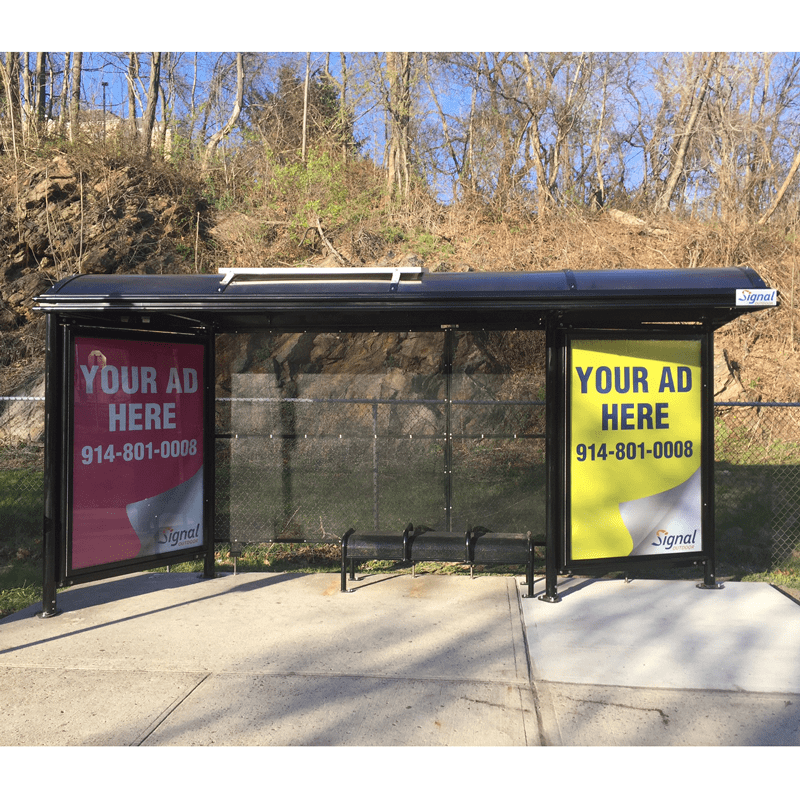 13′ Sierra mansard roof transit shelter with semi v advertising kiosk, lexan roof panels, no walls, optional street plaque and 6′ contour bench. 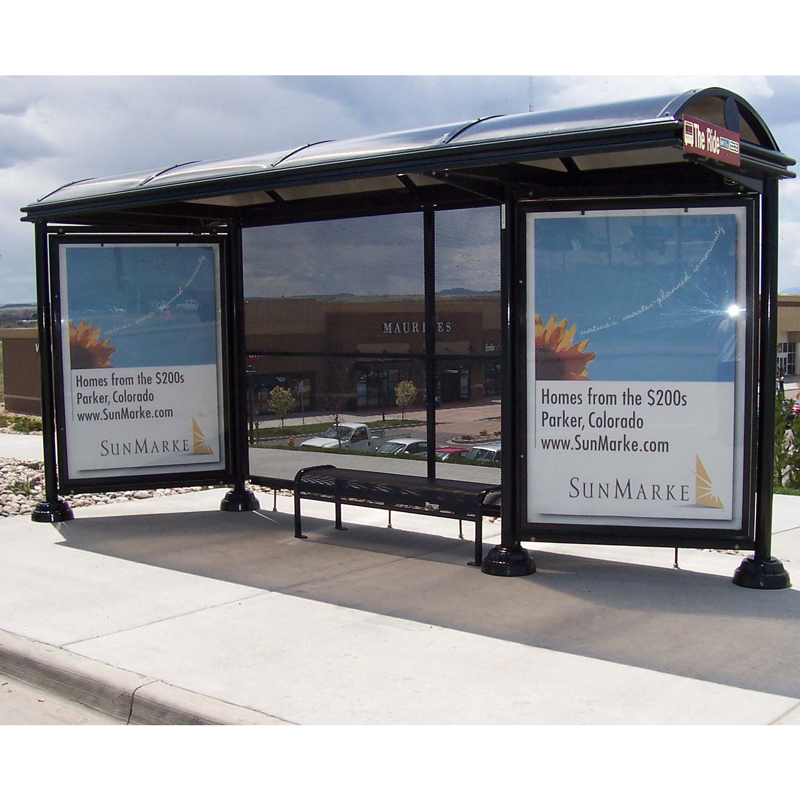 14′ Sierra wide dome roof transit shelter with backlit advertising kiosks at the rear wall, lexan roof panels, roof ends and closed off walls. 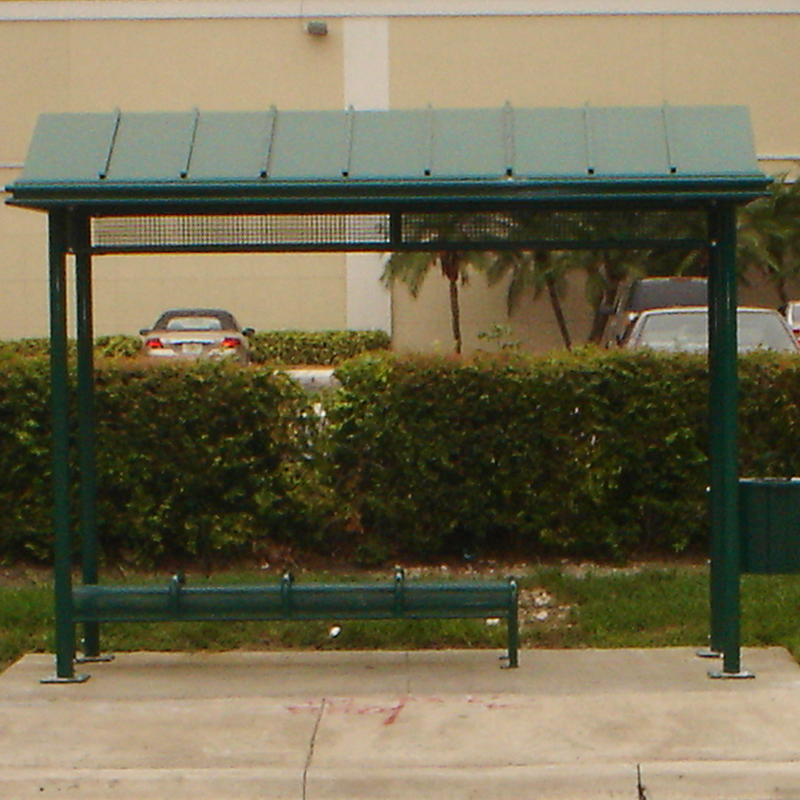 Shown with a perforated metal bench. 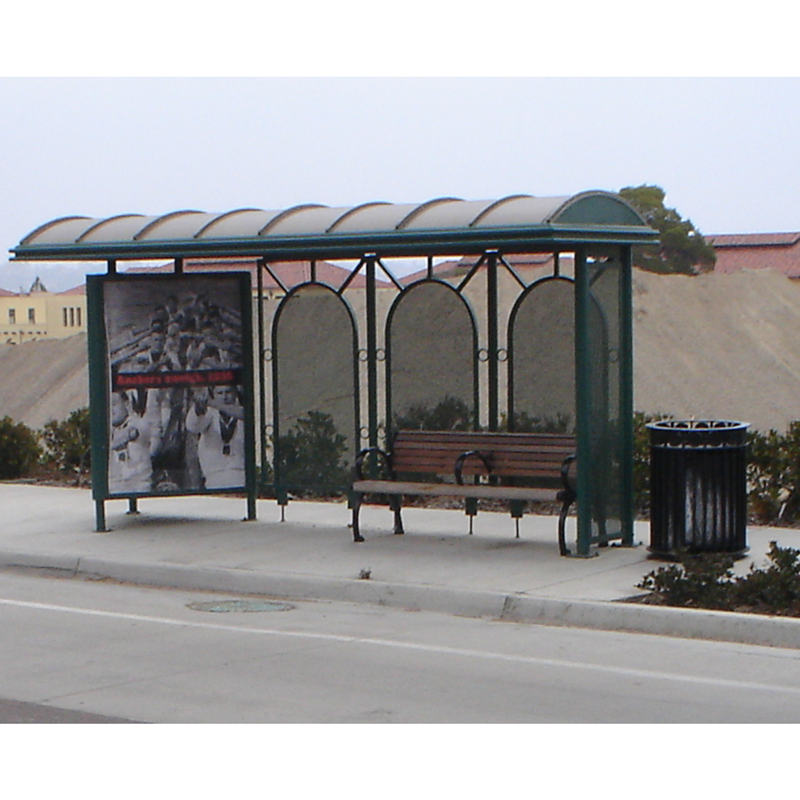 14′ Sierra wide dome roof transit shelter with a v angled backlit advertising kiosk, lexan roof panels, roof ends closed off and perforated metal walls. 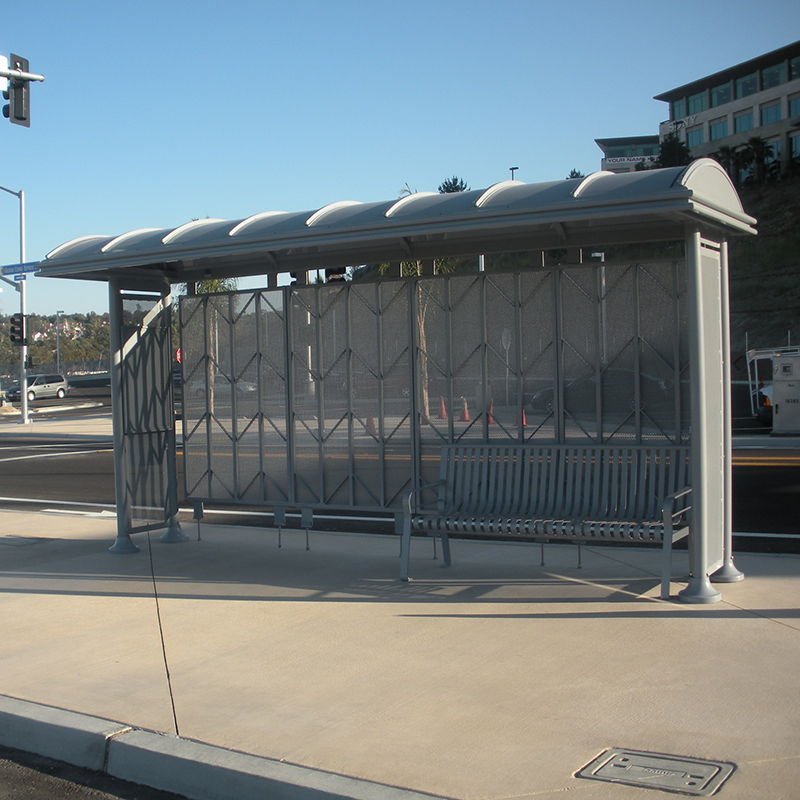 Shown with a perforated metal bench. 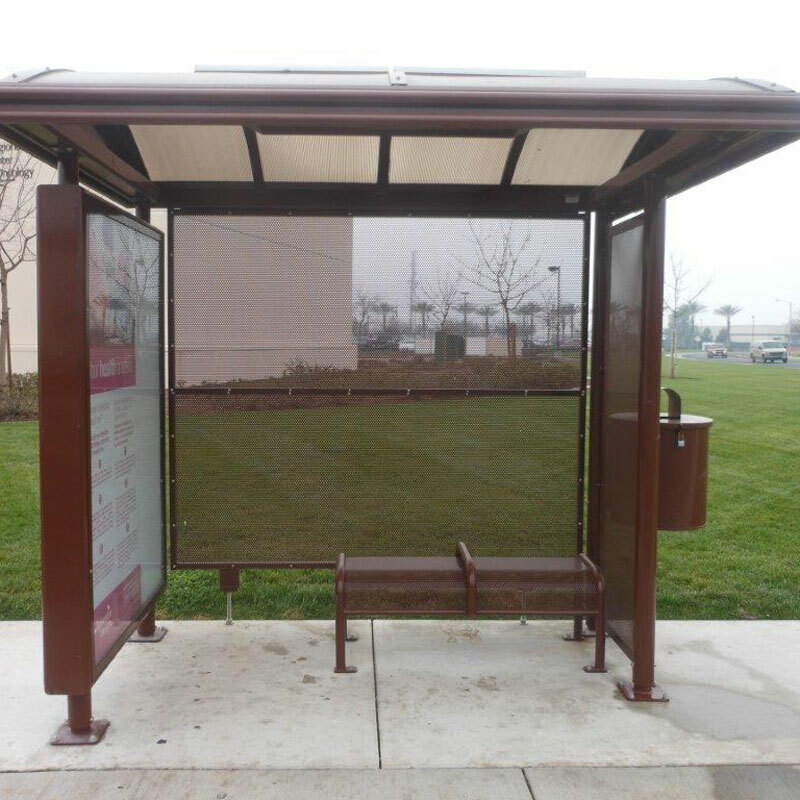 17′ Sierra dome roof transit shelter with a v angled backlit advertising kiosk, lexan roof panels, and perforated metal walls. 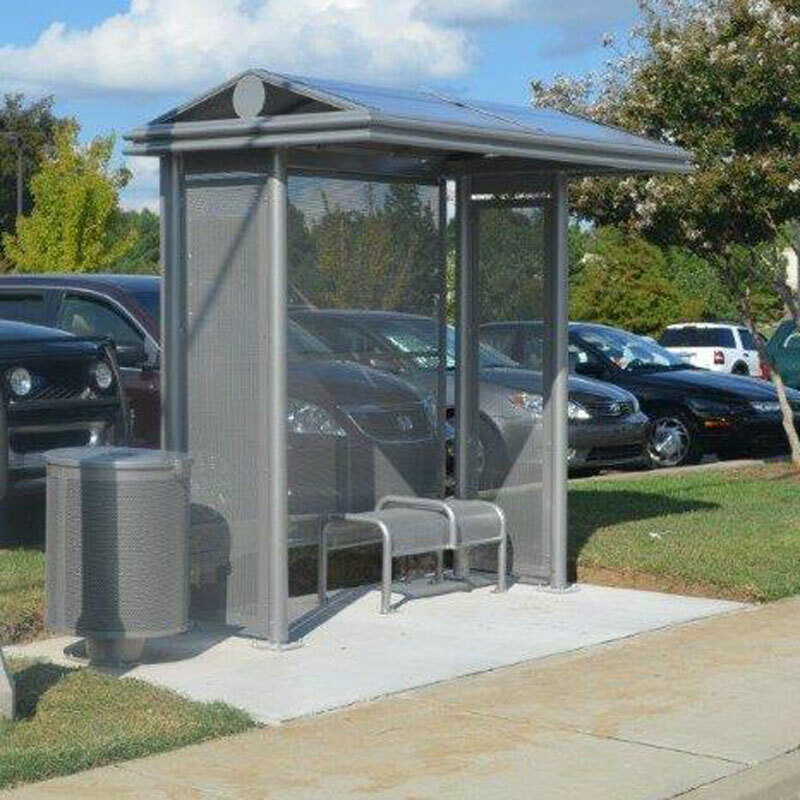 Shown with a perforated metal bench, pole mount trash receptacle and custom agency logo in roof end. 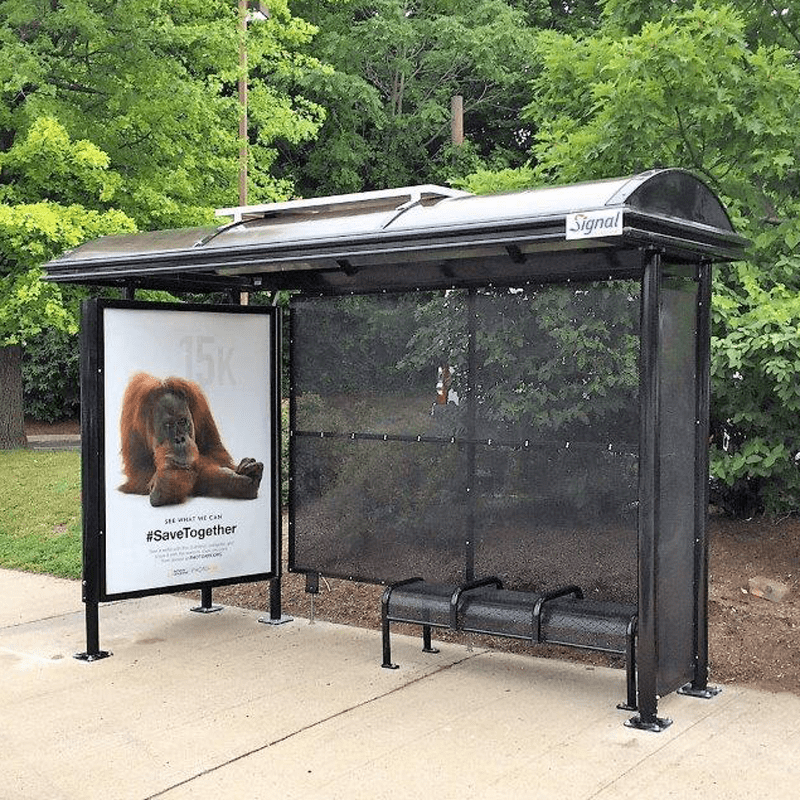 26′ Sierra dome roof transit shelter with dual v angled backlit advertising kiosks, lexan roof panels, and roof ends closed off. 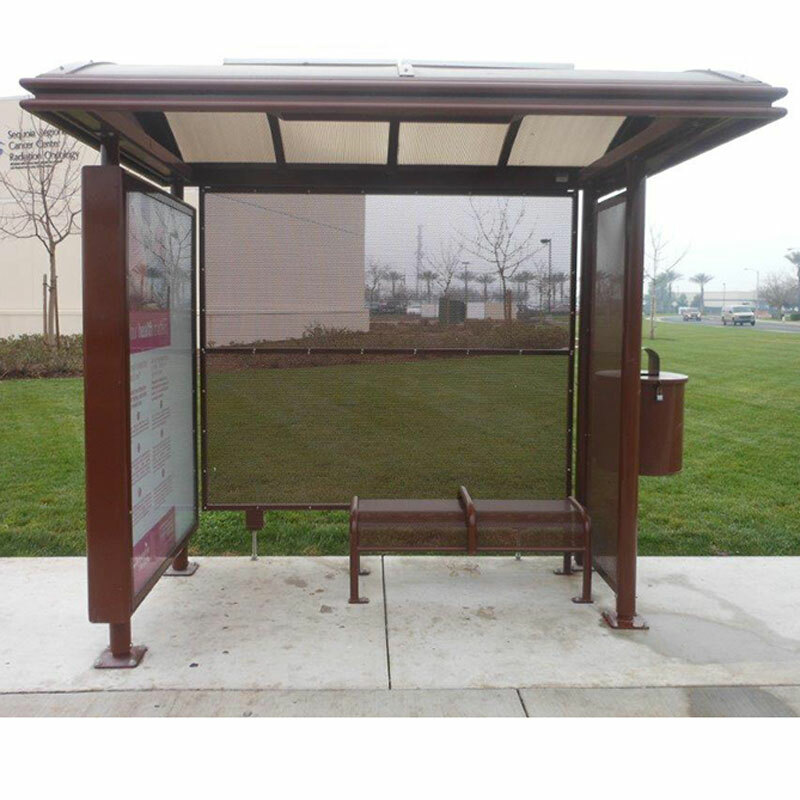 Also, perforated metal rear wall with optional acrylic inserts and perforated metal benches. 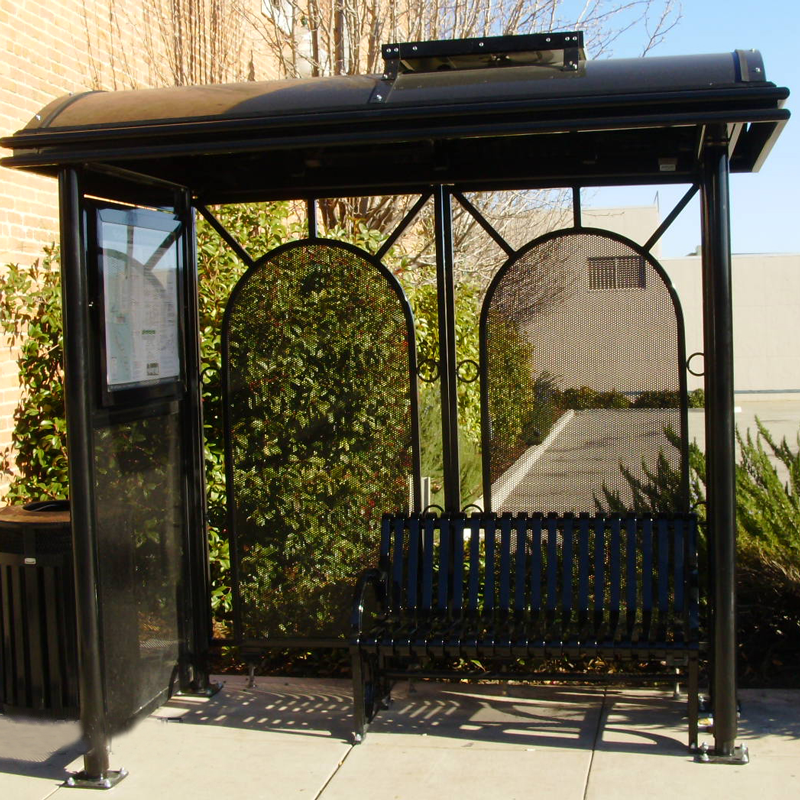 17′ Sierra dome roof transit shelter with aluminum roof panels, decorative roof battens, v angled backlit advertising kiosk, and Victorian-style perforated metal rear wall. 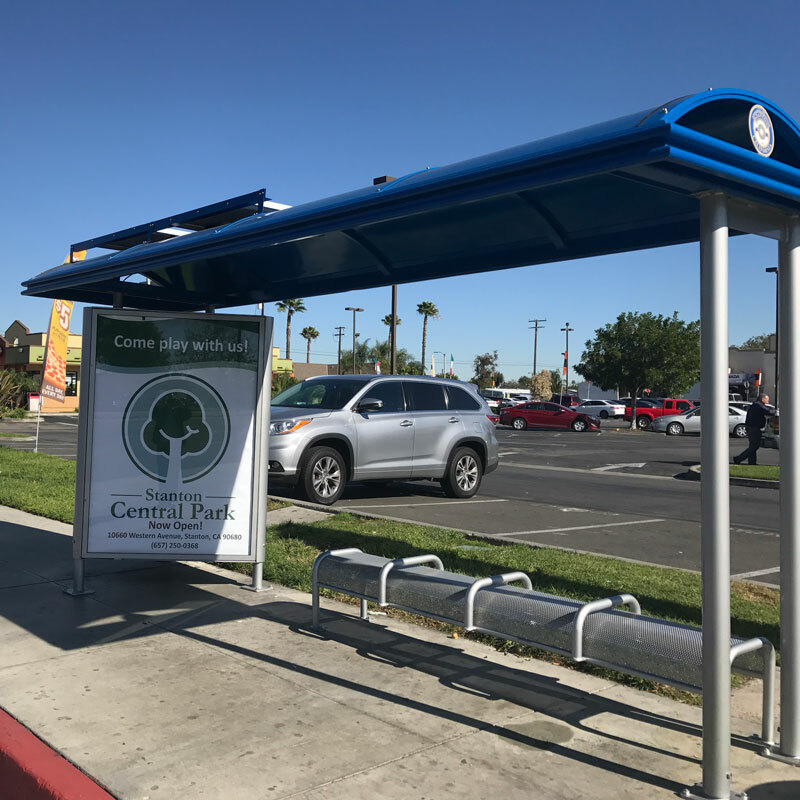 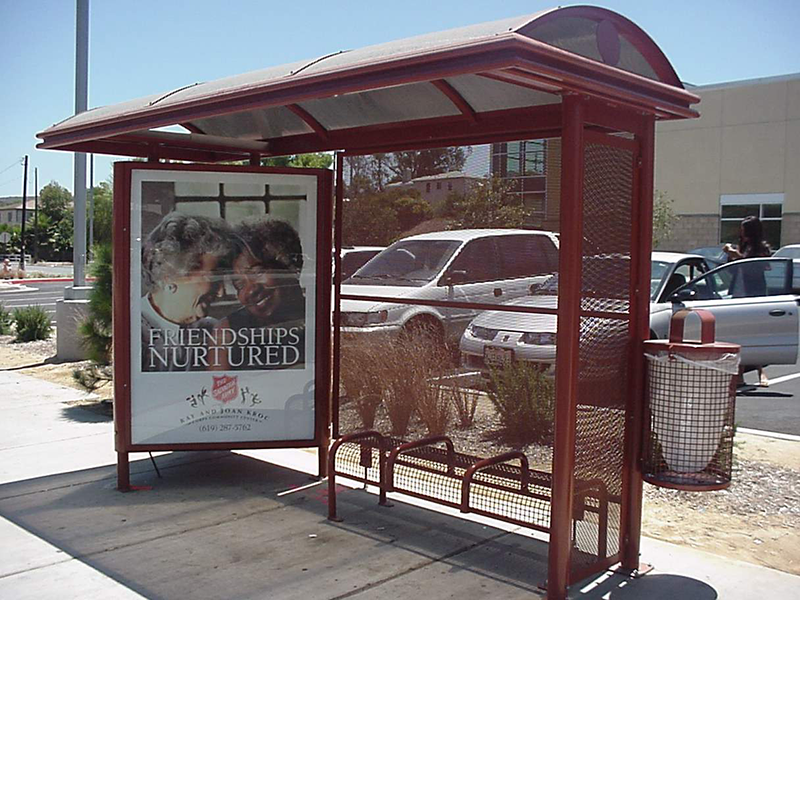 17′ Sierra dome roof transit shelter with twin angled backlit advertising kiosks, perforated metal rear wall, decorative lamppost bases, and perforated metal bench. 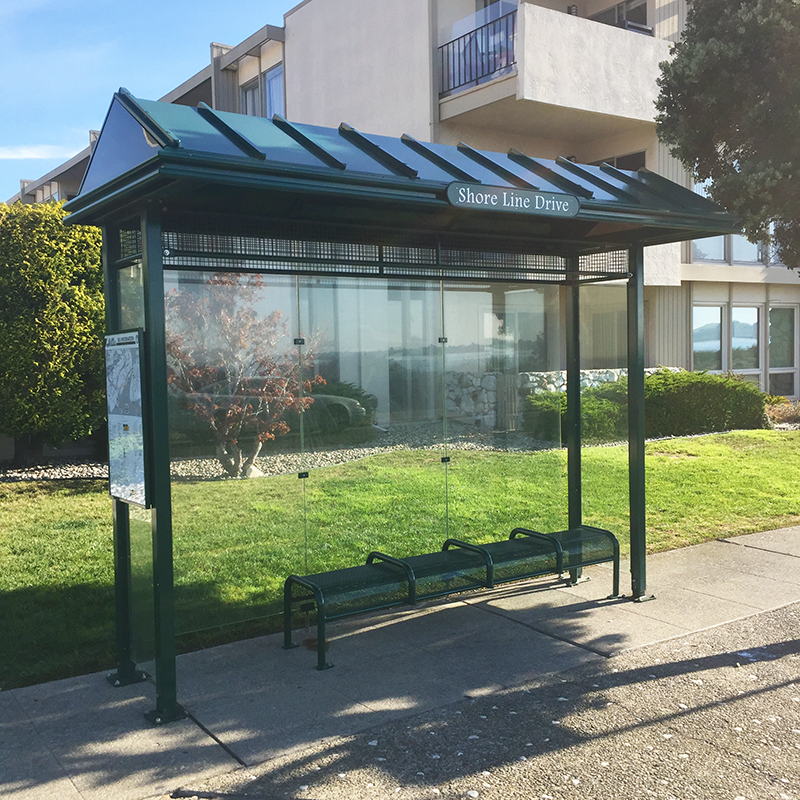 20′ Sierra dome roof transit shelter with v angled advertising and perforated metal rear and end walls, and perforated metal bench. 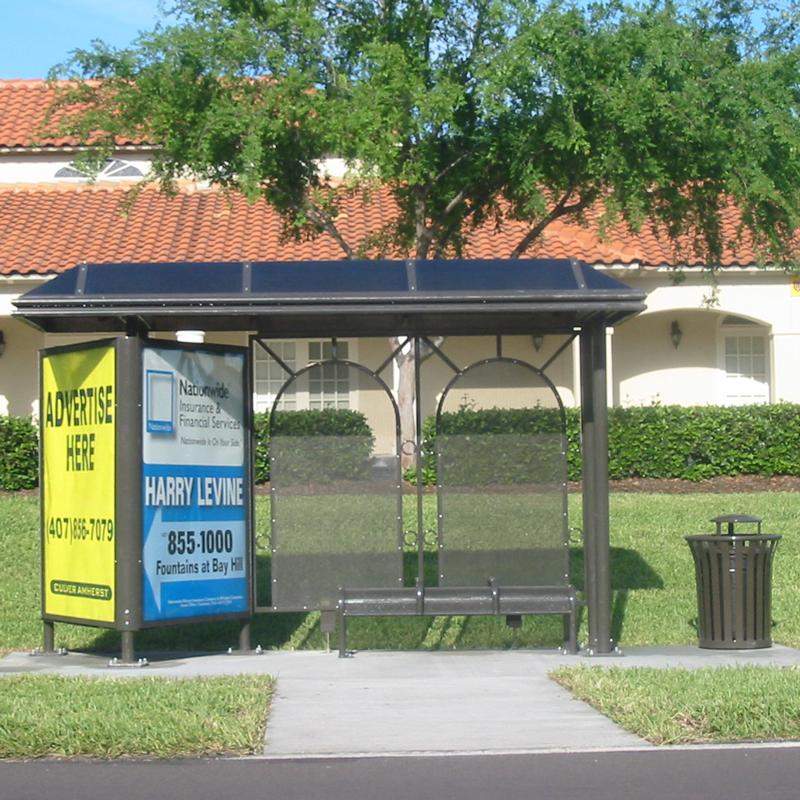 13′ Sierra mansard roof transit shelter with a backlit v angled advertising kiosk, lexan roof panels, Victorian-style perforated metal walls and perforated metal bench. 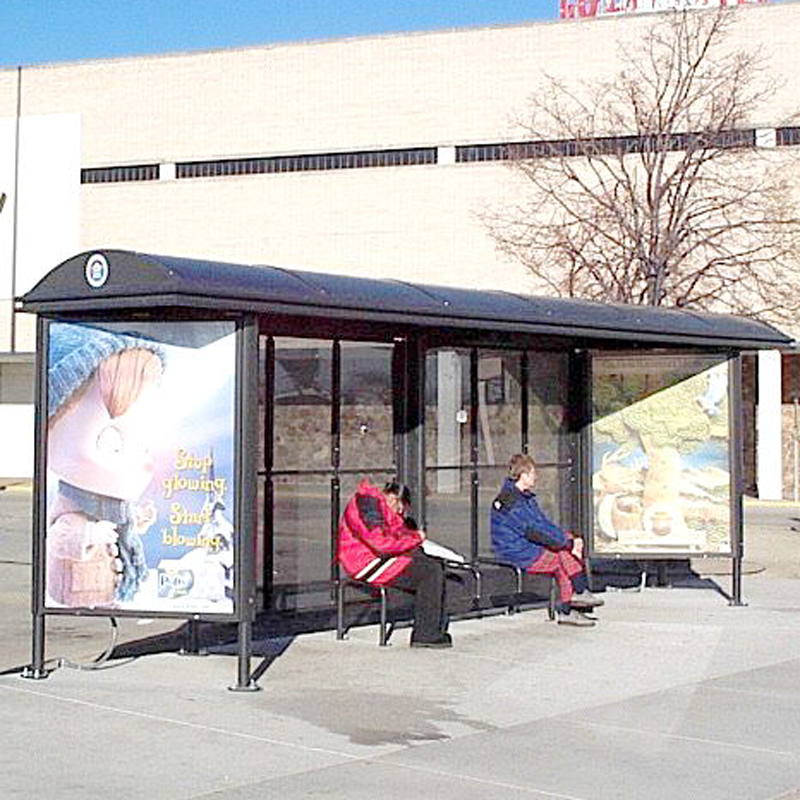 17′ Sierra dome roof transit shelter with a backlit v angled advertising kiosk and perforated metal walls. 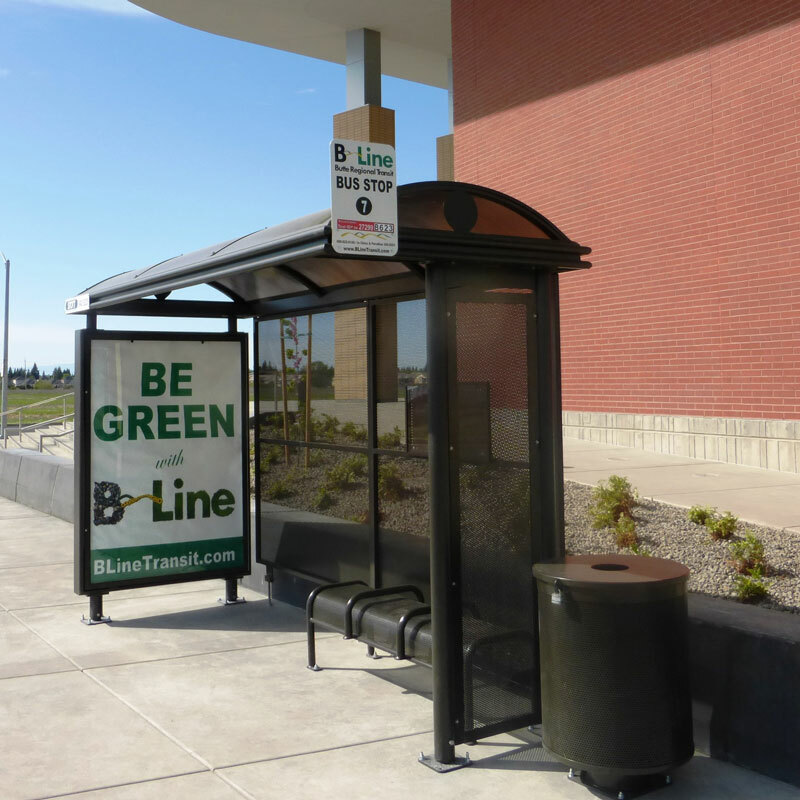 Shown with an 8′ wire grid bench and wire grid trash receptacle. 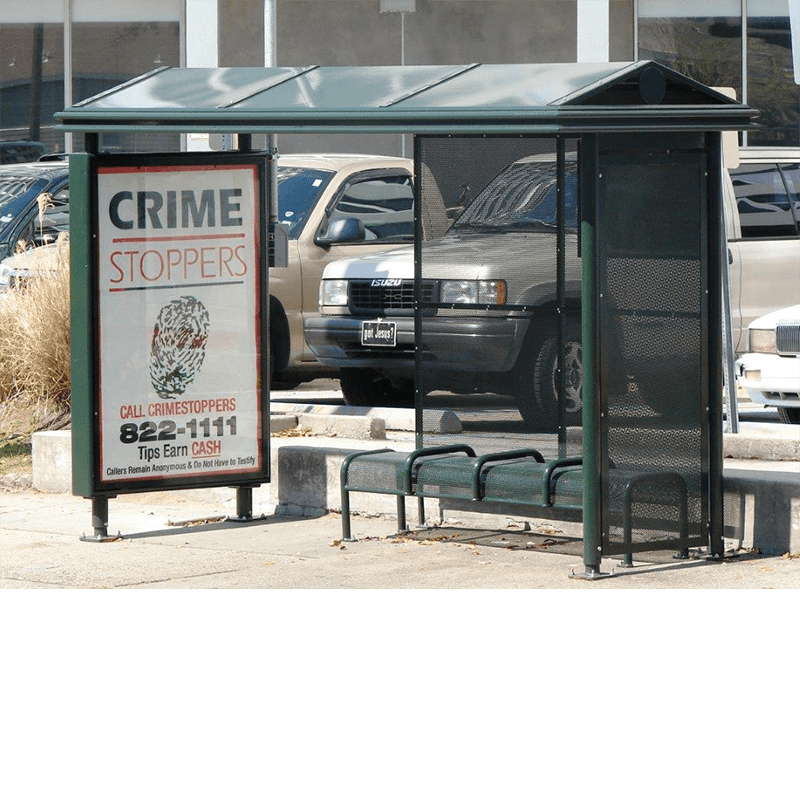 8′ Sierra dome roof transit shelter with a backlit flat back-to-back advertising kiosk, lexan roof panels, and 3/8″ clear tempered safety glass at the back and end walls. 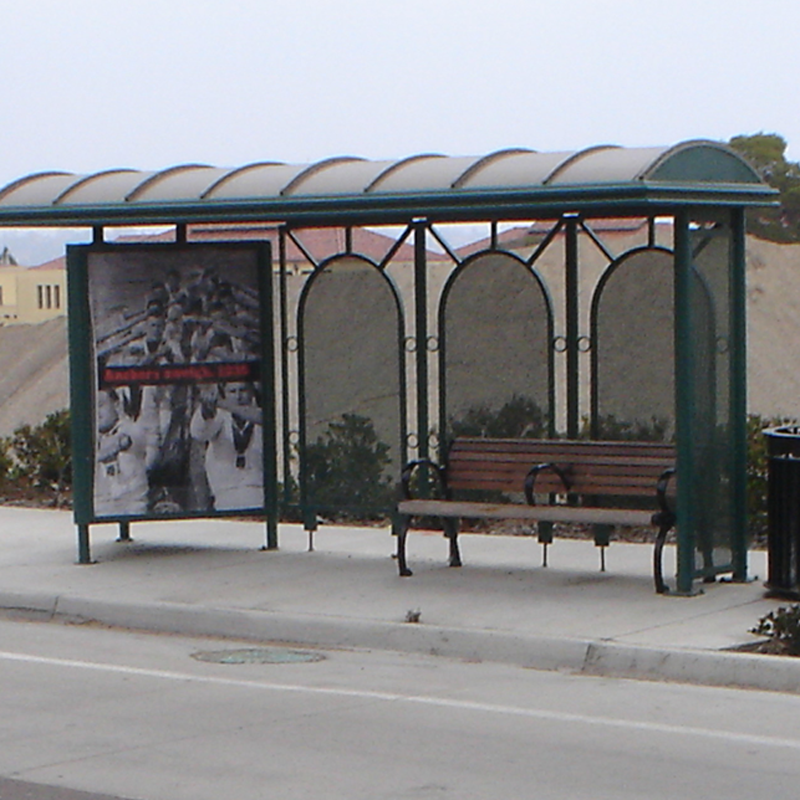 Shown with 40″ perforated metal bench with anti-vagrant bar.